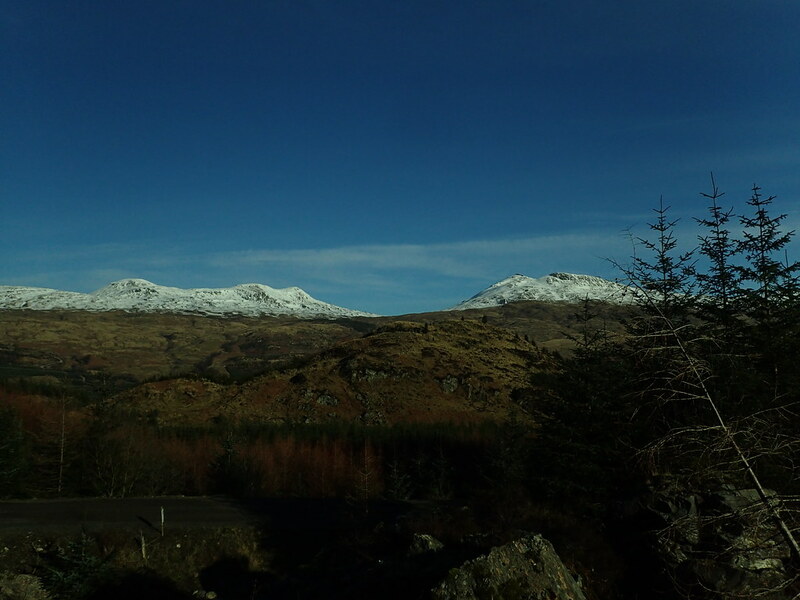 Another day and another superb clear blue sky morning. 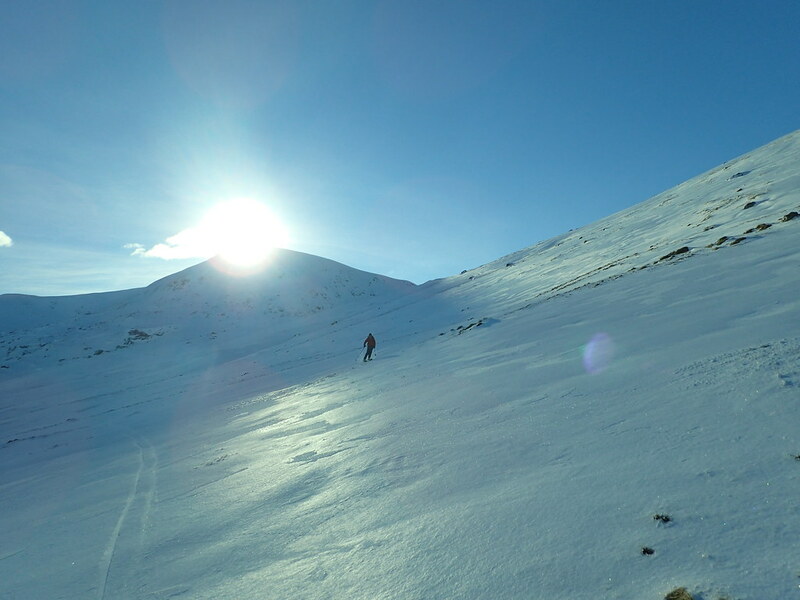 Hopes were high that the sun would stay with us all day and deliver a classic. 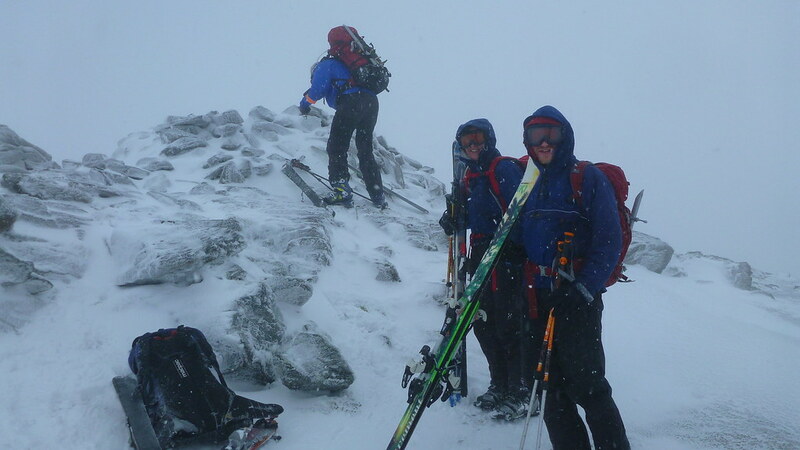 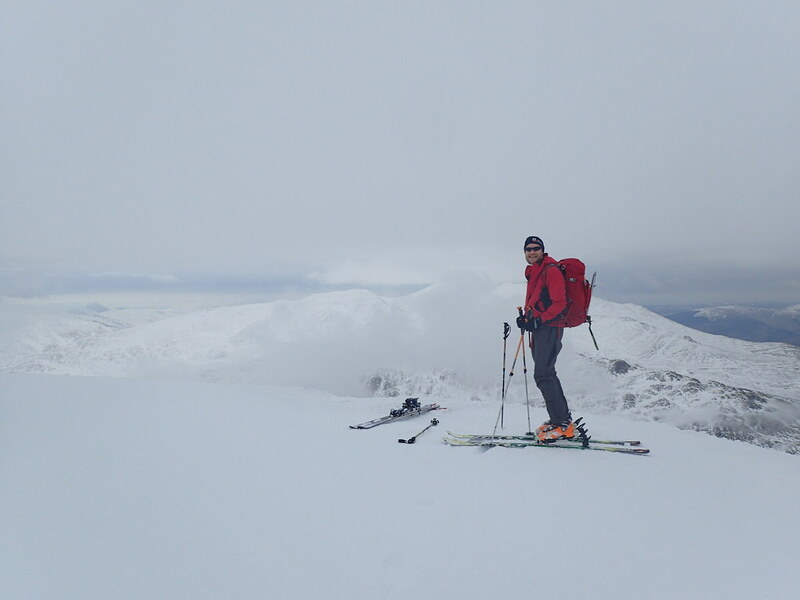 More Ski Mountaineering was on the cards so we ramped things up a notch and decided to tackle Ben More, the highest of the Southern Highlands at over 3,800 feet and a “serious” ski route according the guidebook. 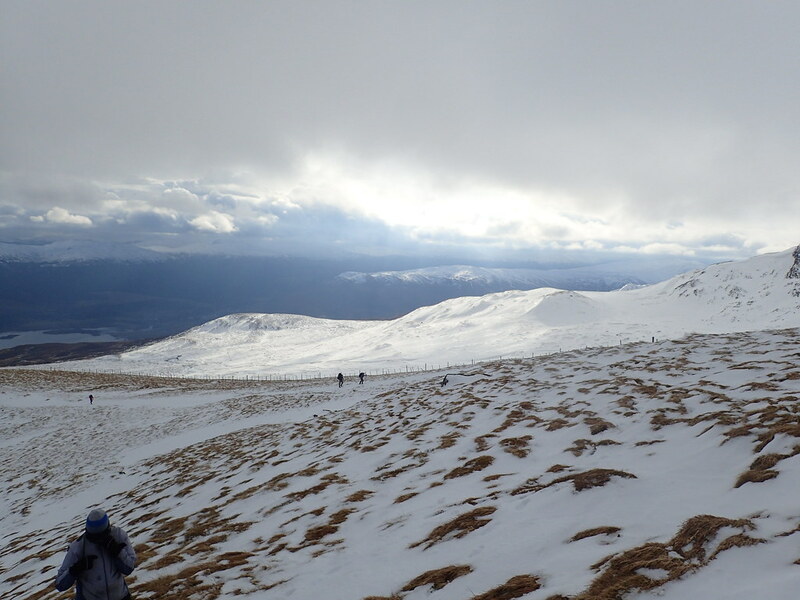 We reached the ridge and the views were just immense. 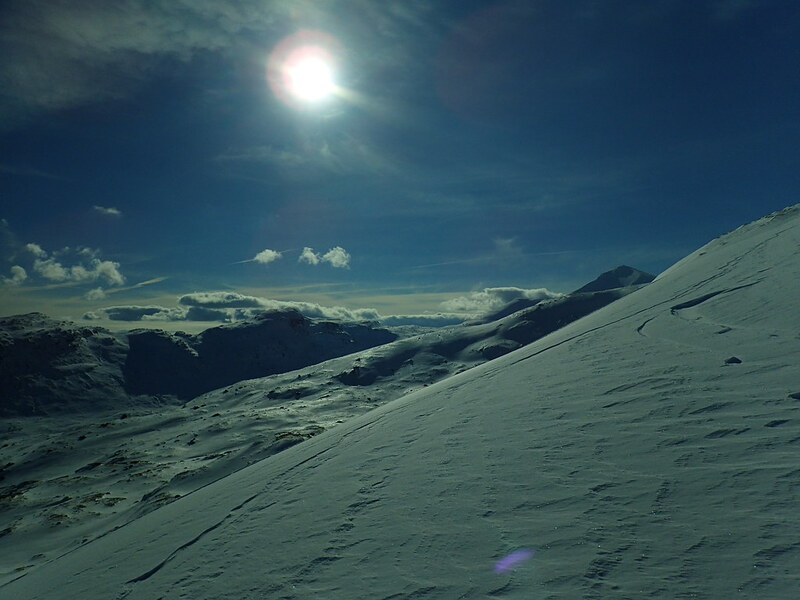 Distant mountains and the light making waves on the sculpted frozen snow. 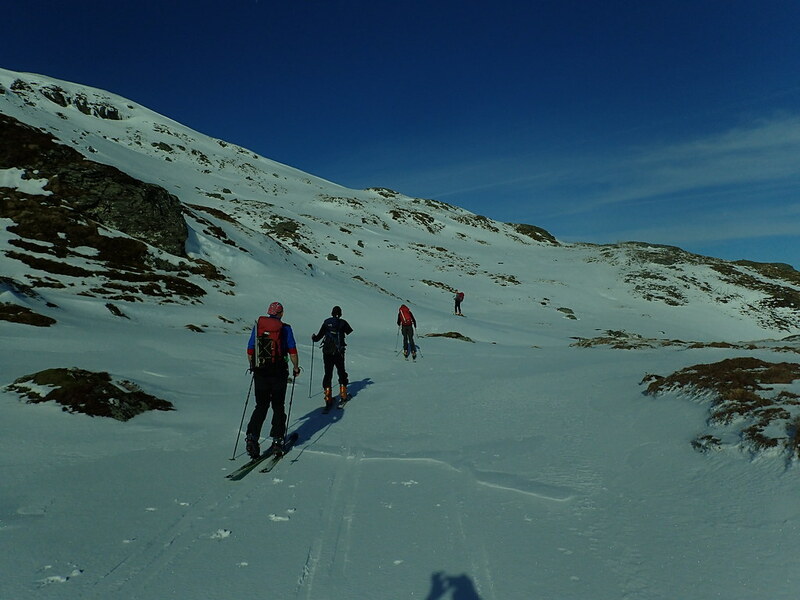 It was tricky descent, steep, with a serious drop off to the left and mix of ice and rocky slopes. 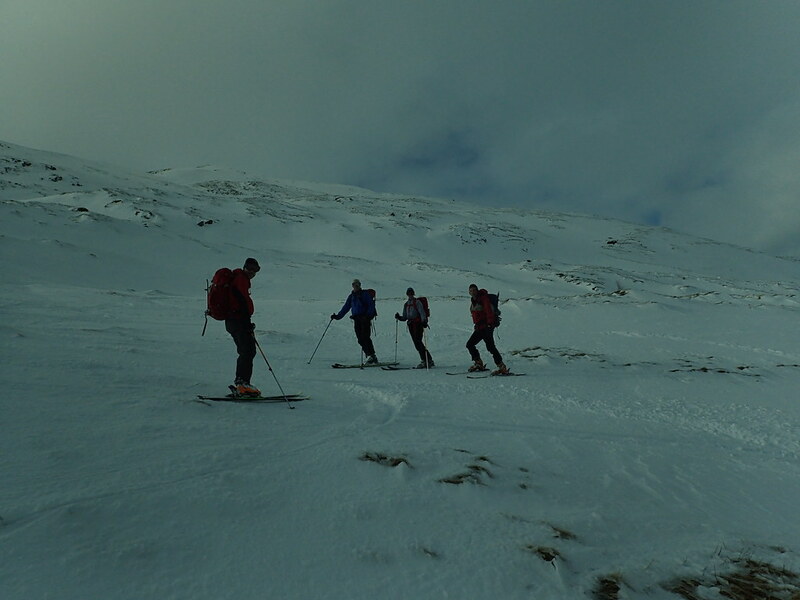 A couple of the group tried to head straight down and ended up having to remove skis and climb down. 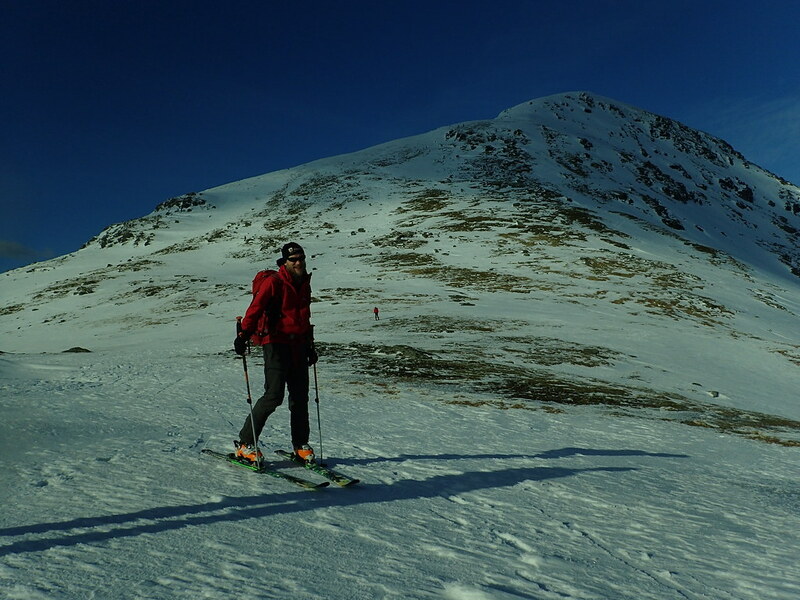 Me and JC headed right and found a decent route down (scarring my skis on the bare rocks) and down to the col. 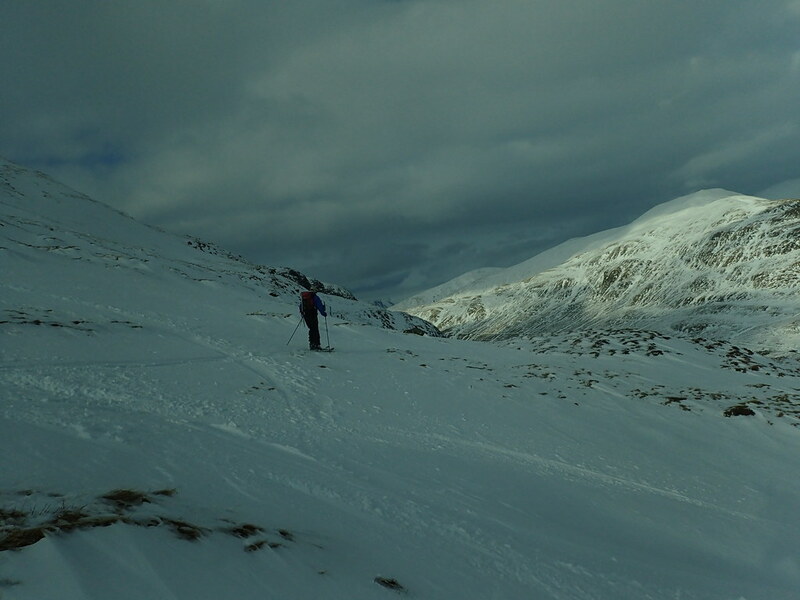 So, after an extended scoff of goodies me and THO headed down. 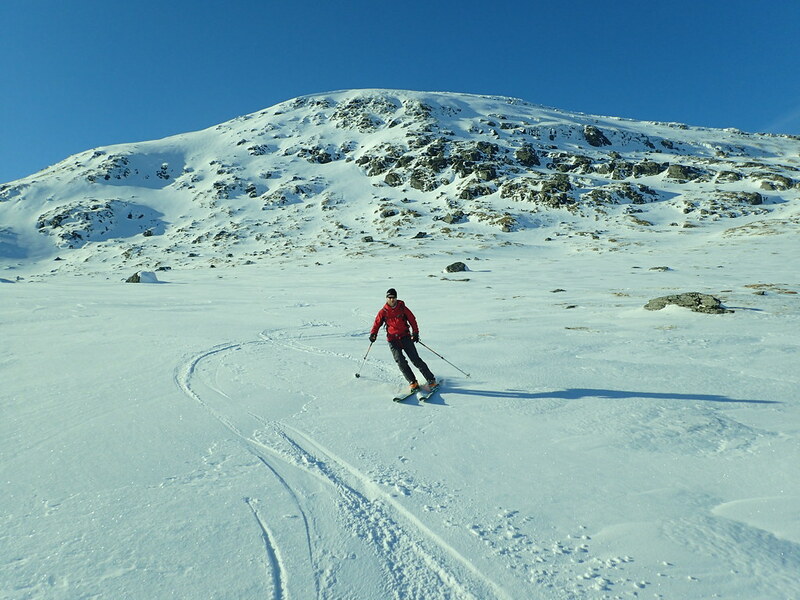 The corrie wasn’t steep but it was completely plastered in snow and was a truly magnificent easy cruise down on perfect untouched snow. 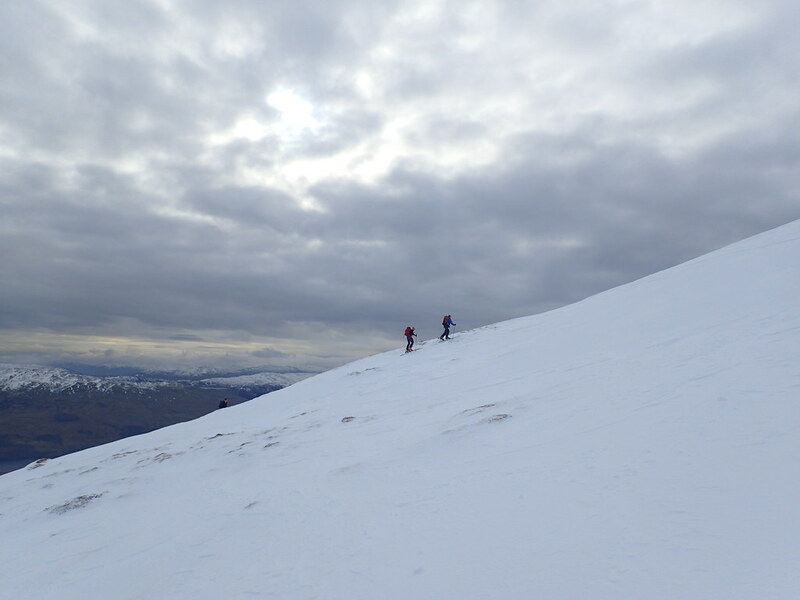 The earlier descent almost meant we were in the sun the whole way down. 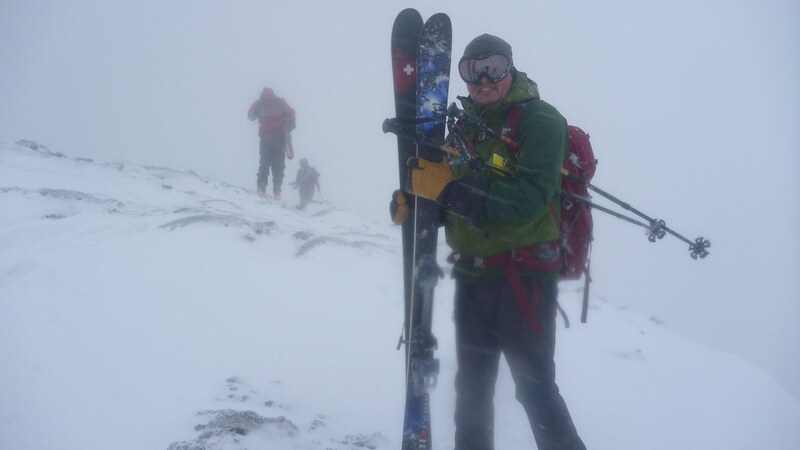 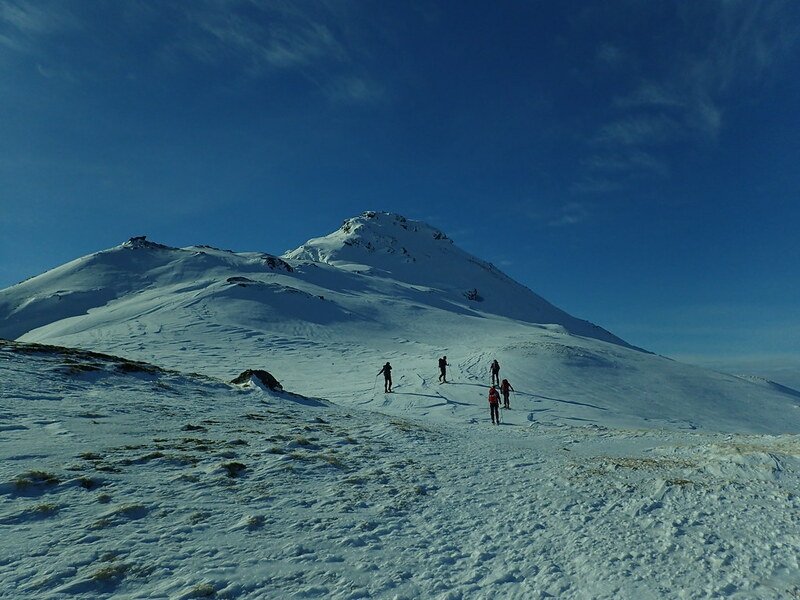 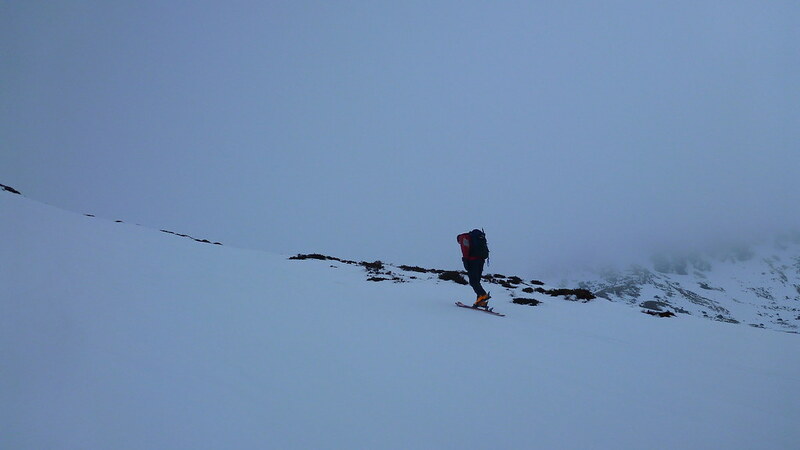 One of the fun parts of Ski Mountaineering is picking a route as the snow starts to thin out. 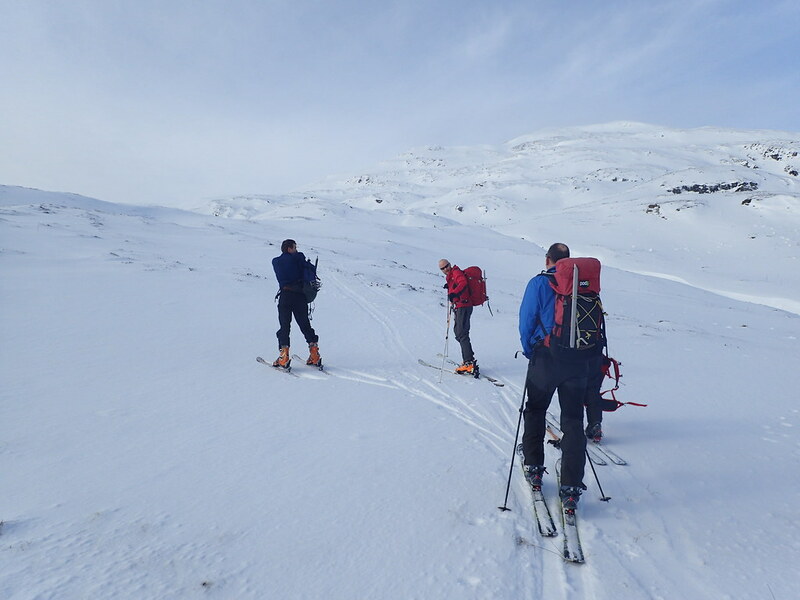 We had a great time weaving in and out of snow filled peat hags on ever patchier snow, desperately trying to find the last possible spot to take off the skis. 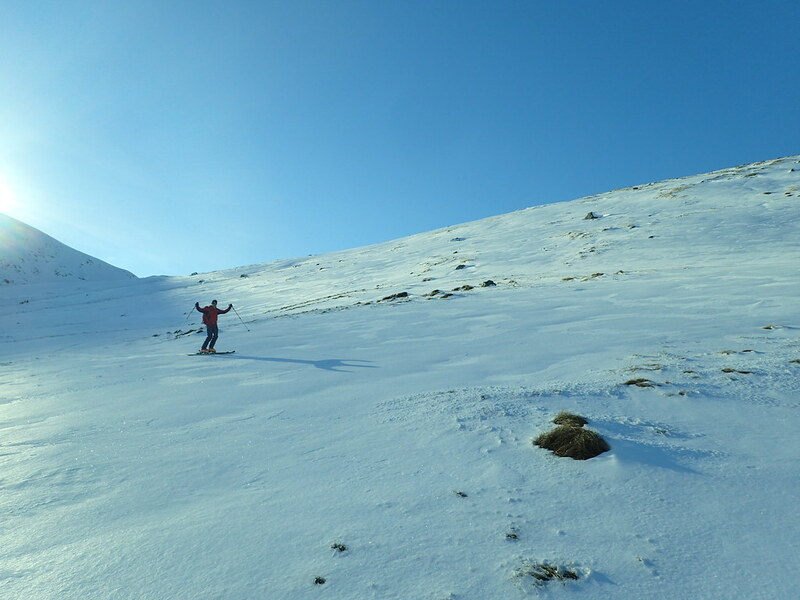 Eventually you end up on slopes more grass than snow with patches only a foot or so wide in places. 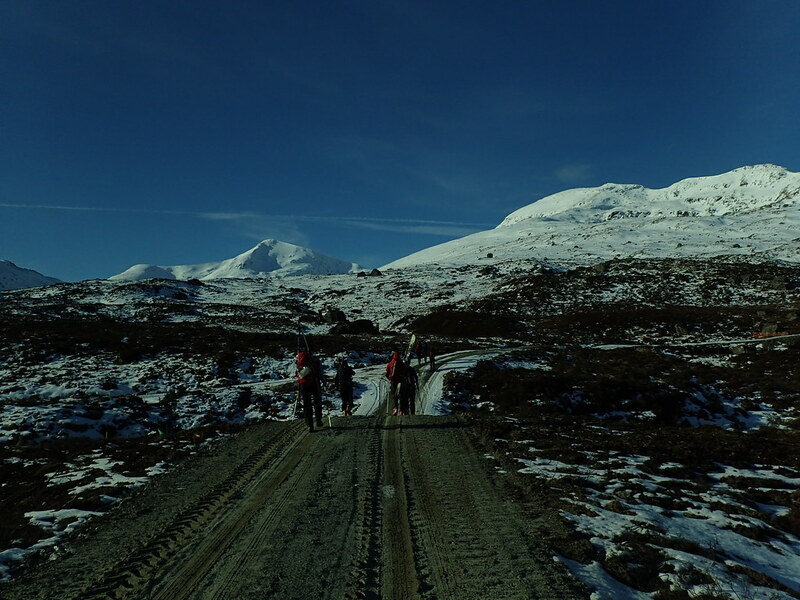 We managed to hitch a lift all the way down the forestry track with one of the guys working on the Hydro Scheme in the valley. 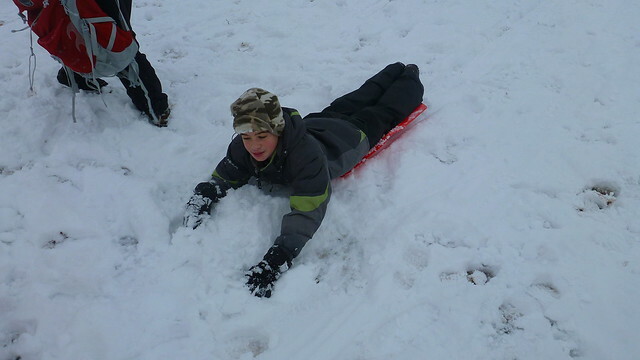 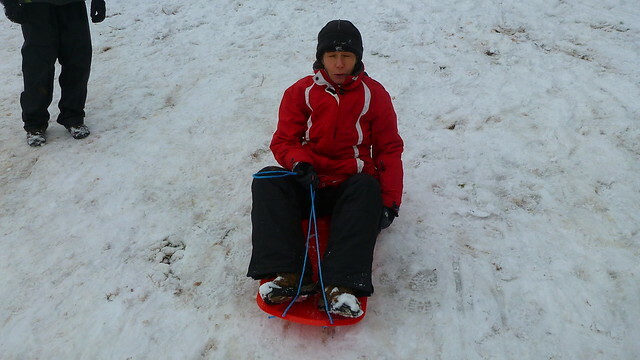 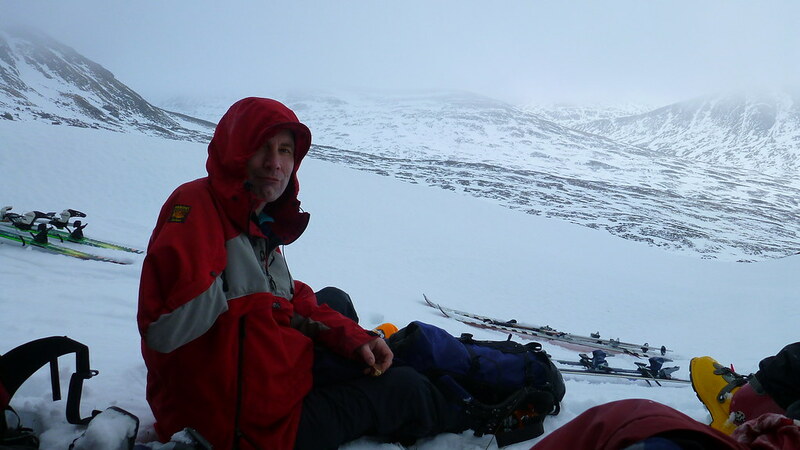 Our winter trip to the Southern Highlands has been a fixture now for 10 years. 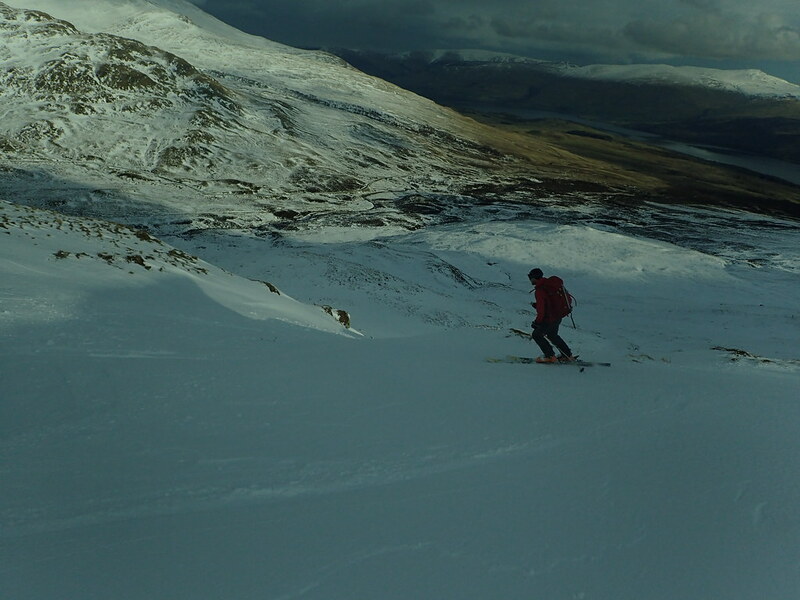 In that time we’ve had a few days of sunshine and a couple of days of proper winter conditions. 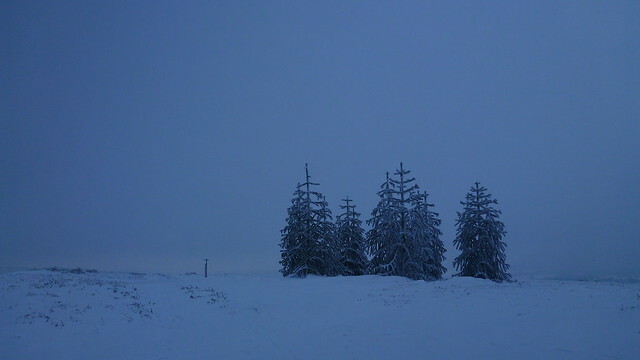 We’ve never had both together and the weather has always been mixed although the weather has never been a complete washout. 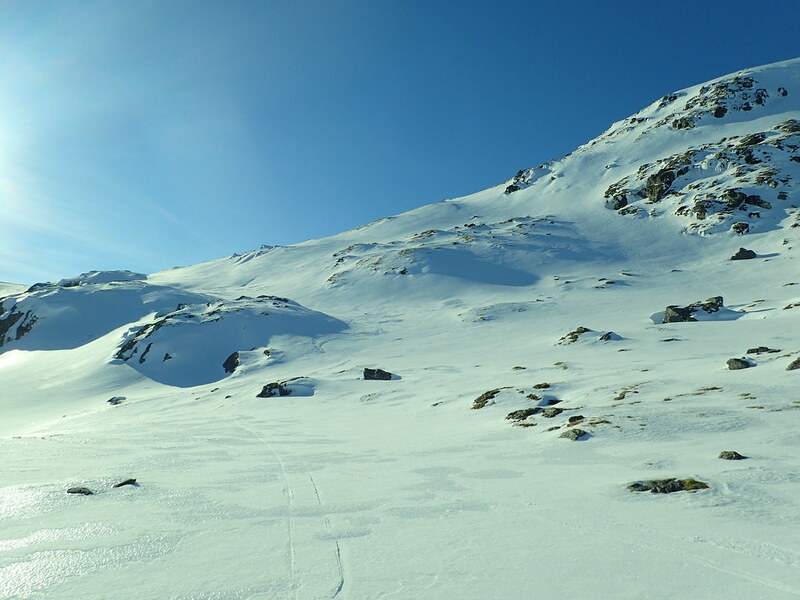 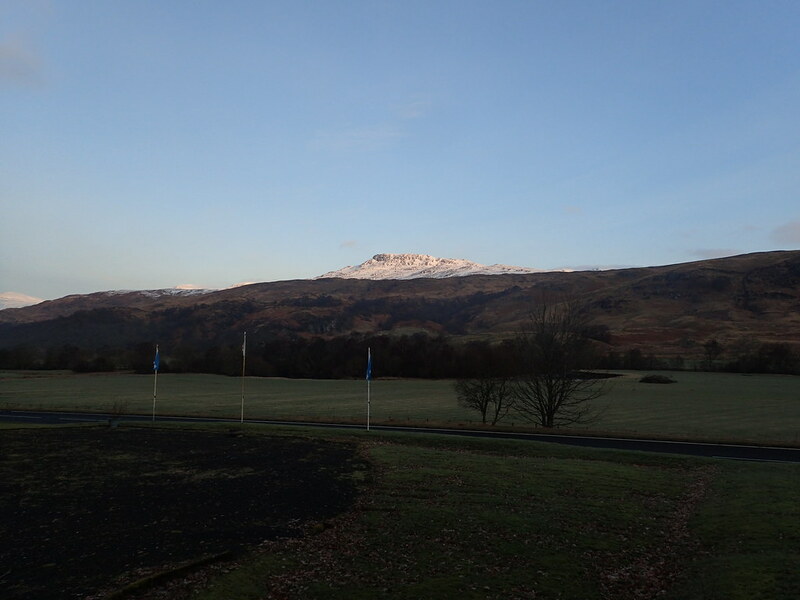 This year, our 11th, the forecast looked promising with high pressure and cold weather following a snowy spell giving much hope for a great conditions. 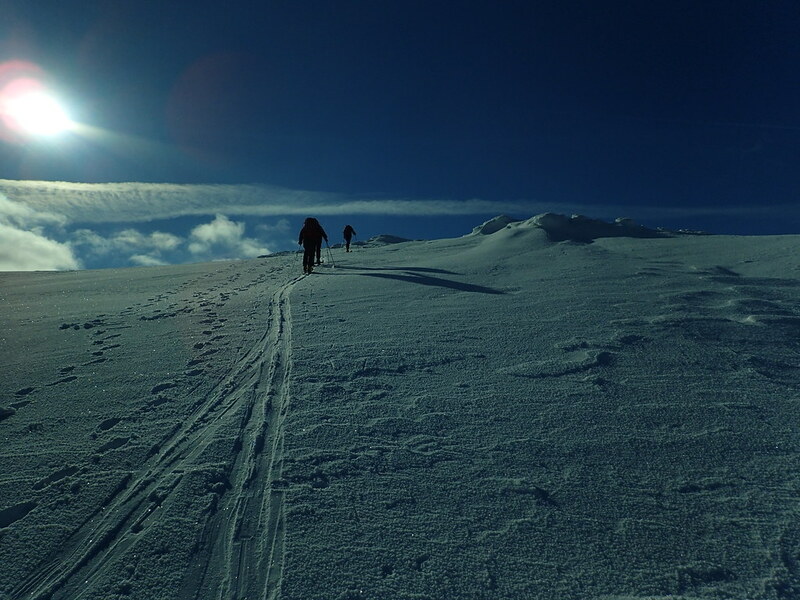 Drawing back the curtains on the Friday morning gave substance to that hope. 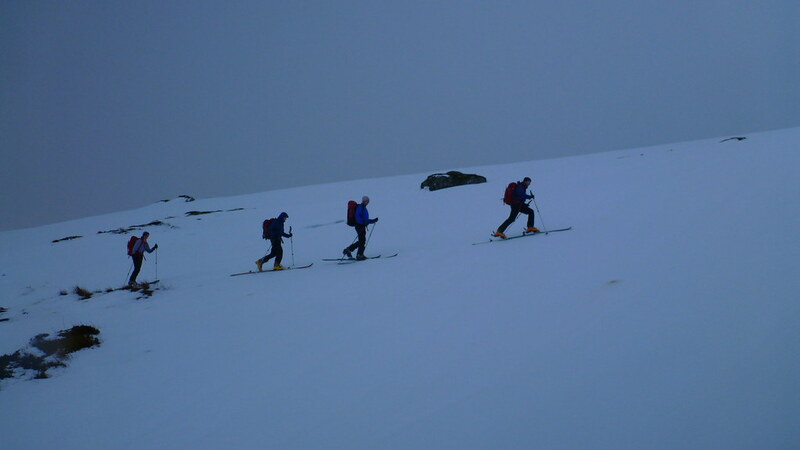 Lots of deep fresh snow equals a chance for some ski touring. 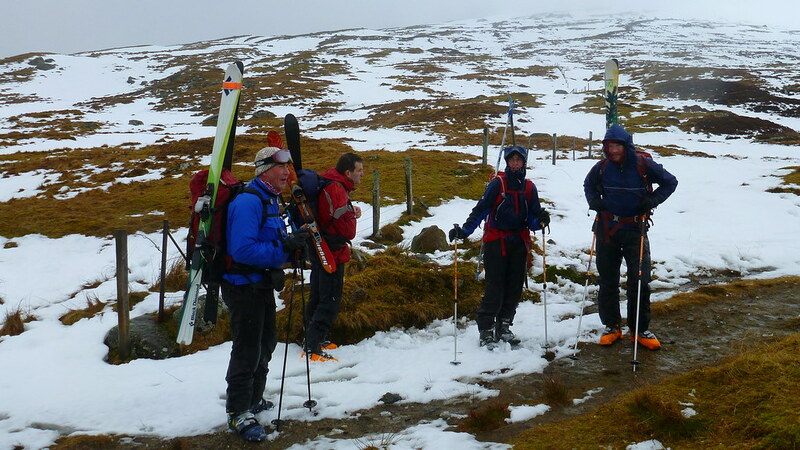 I abandoned TBF to the tender mercies of the Sheffield Boys while we headed to Lochan na Larige for a high start. 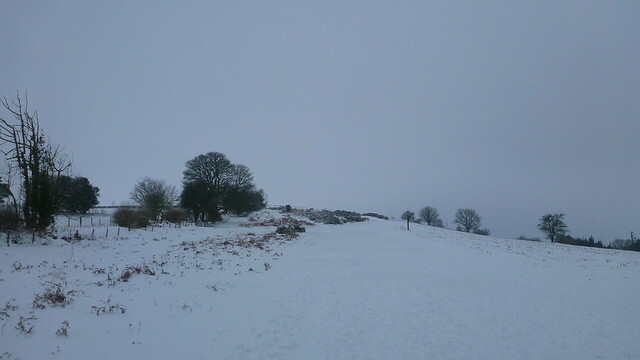 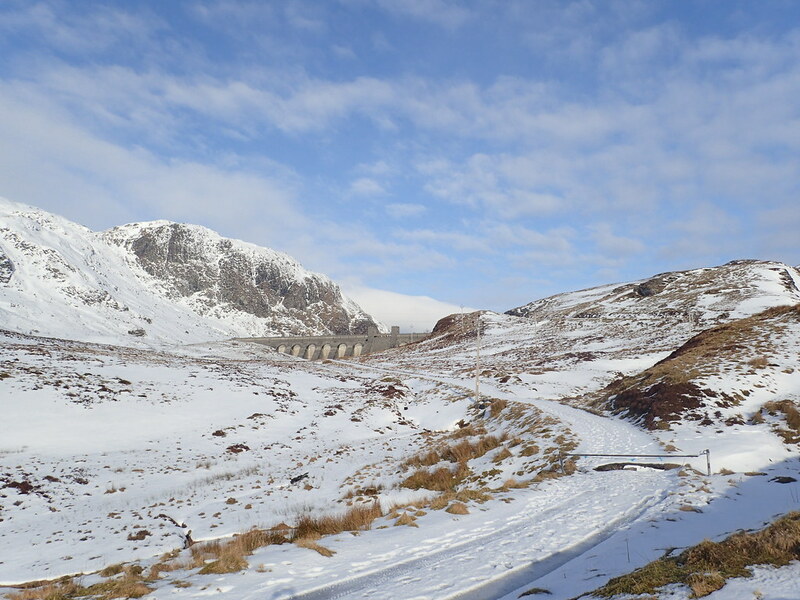 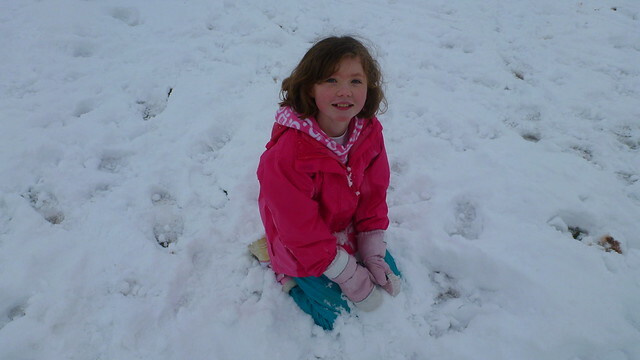 We had park below the reservoir as the road was blocked by snow and ice. 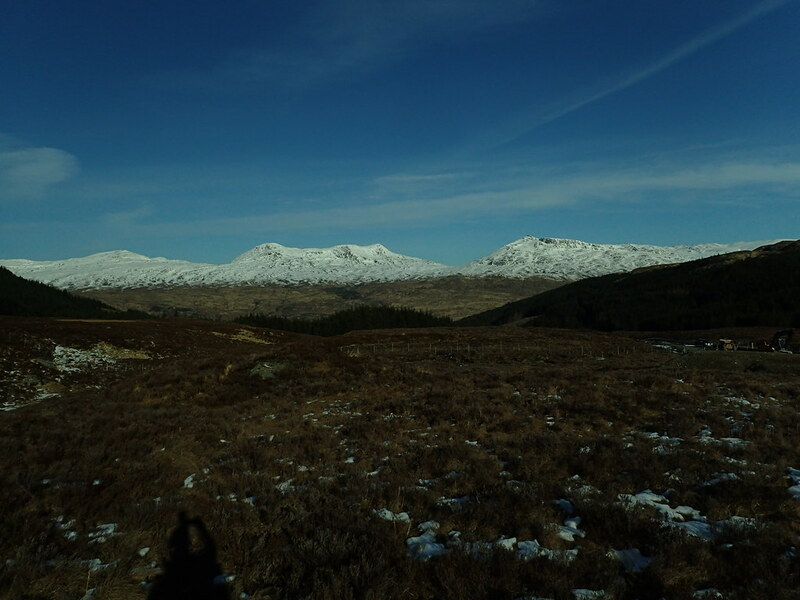 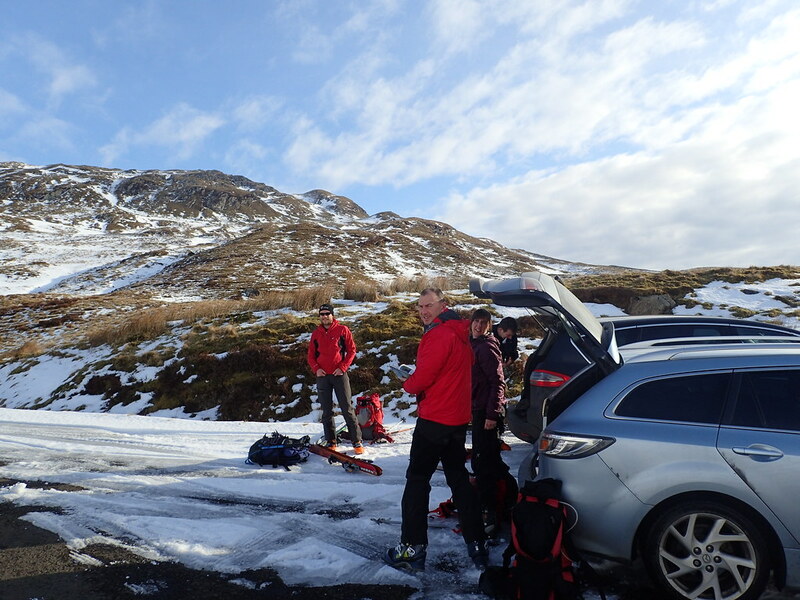 Spoilt for choice with the mountains plastered in snow above 500m, and after much debate we settled on Meall Nan Tarmachan. 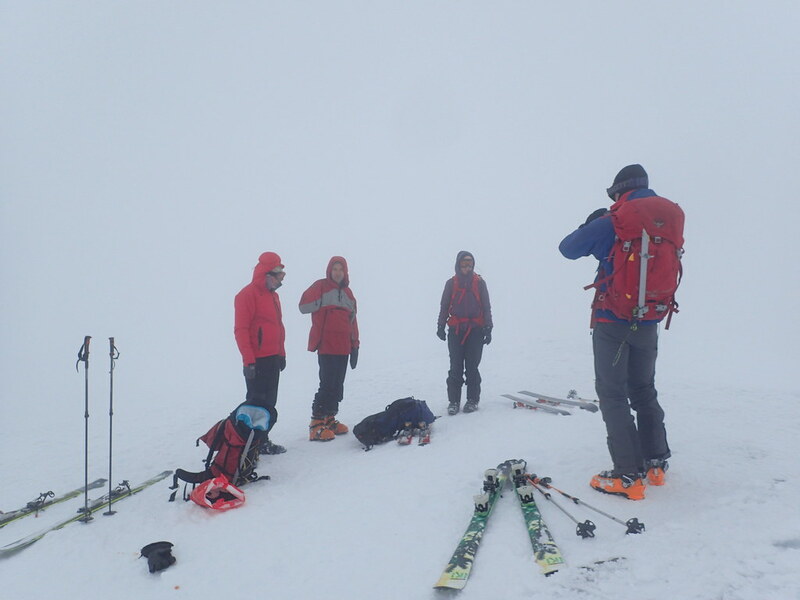 By the time we reached the summit it had reached us as well so it was the briefest of stops, tinged with a little disappointment that the fine start to the day had petered out. 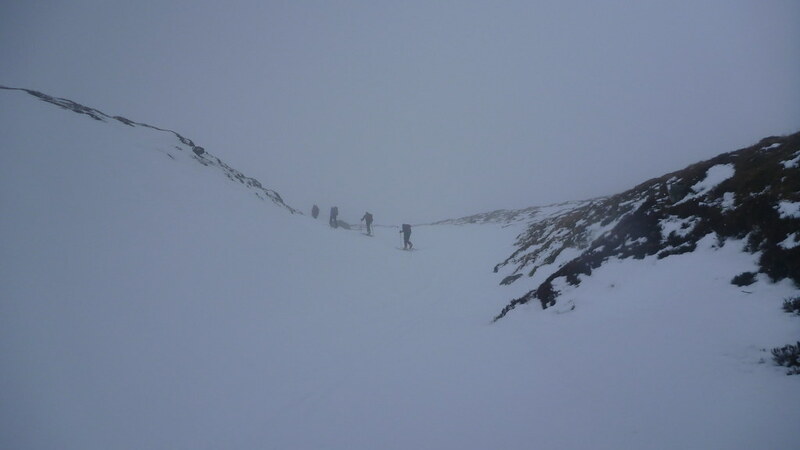 For most of us climbing under the pipe was the only time we took skis off all day. 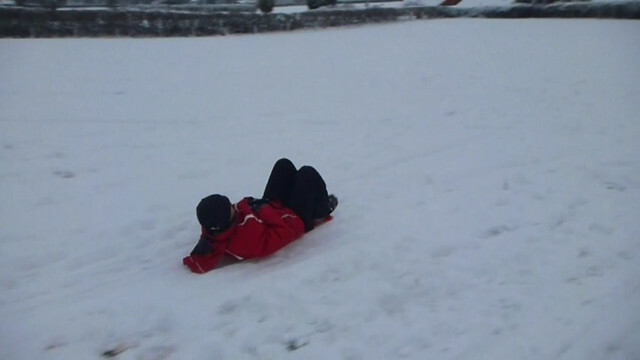 MM made a very brave effort at trying to limbo underneath without taking them off. 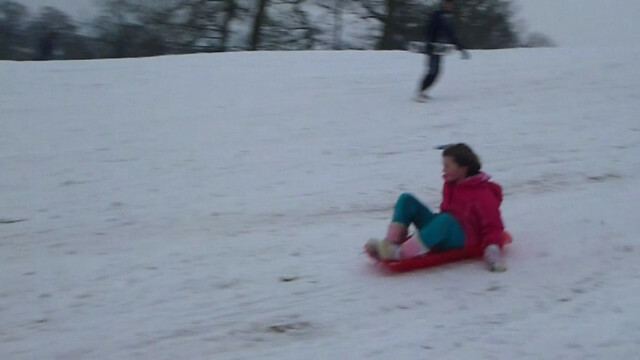 A then made it look easy! 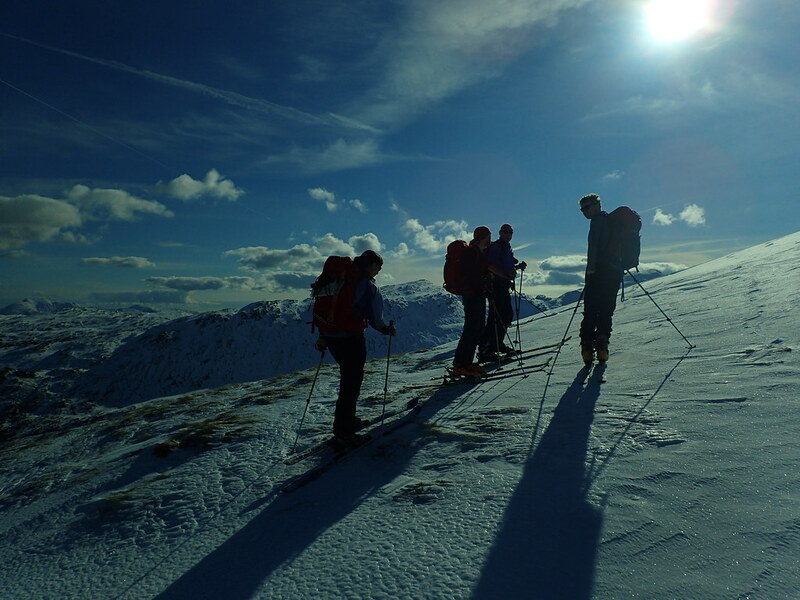 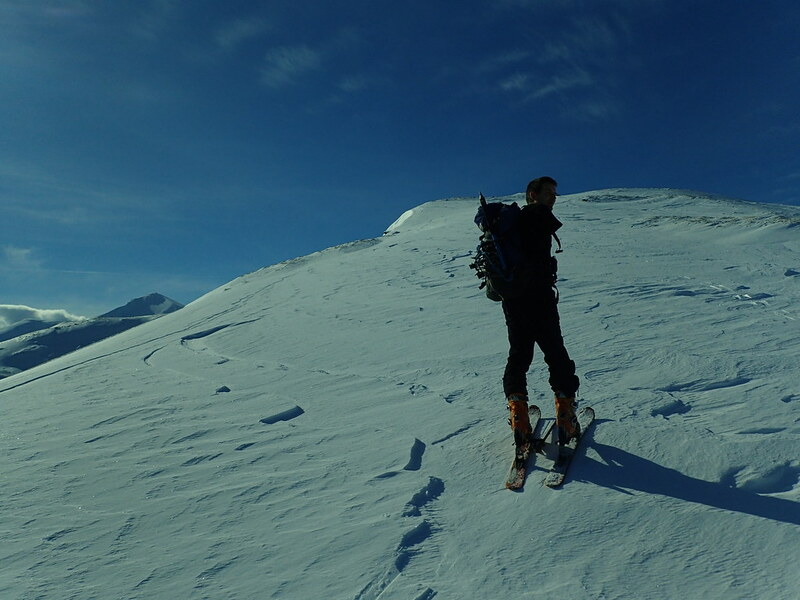 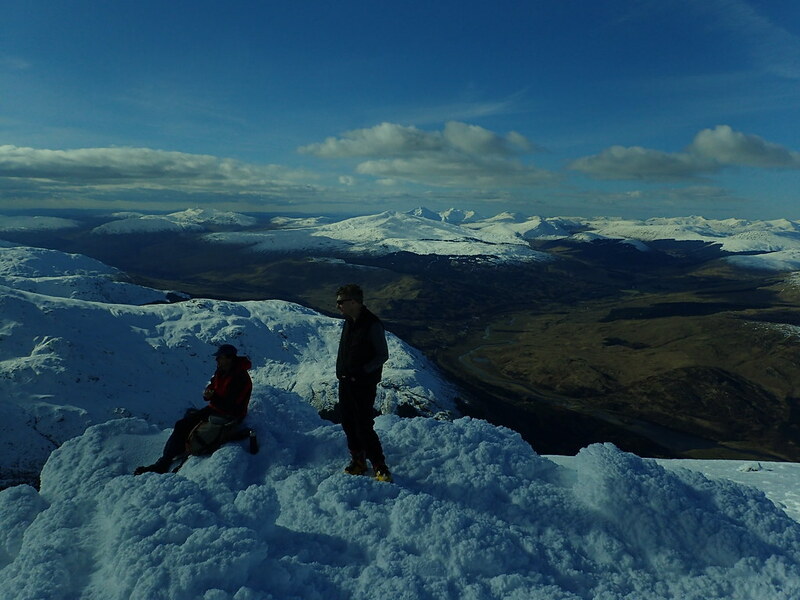 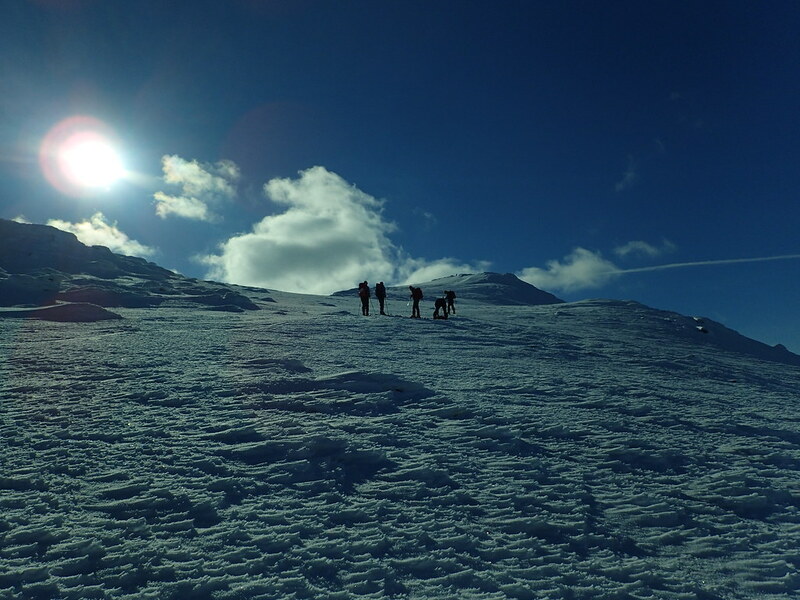 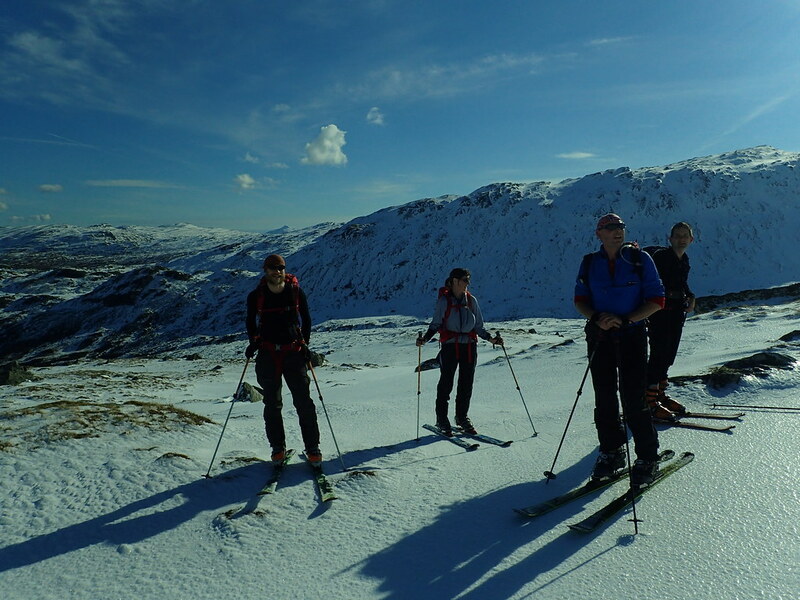 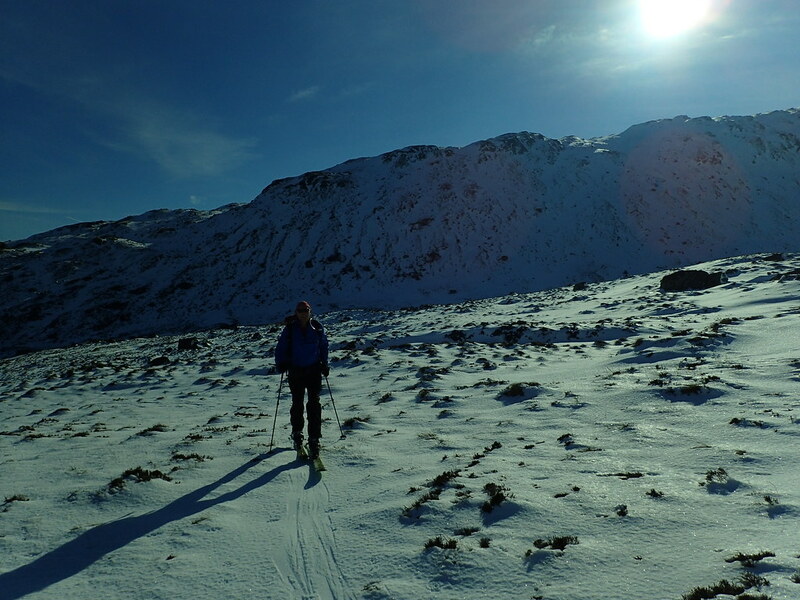 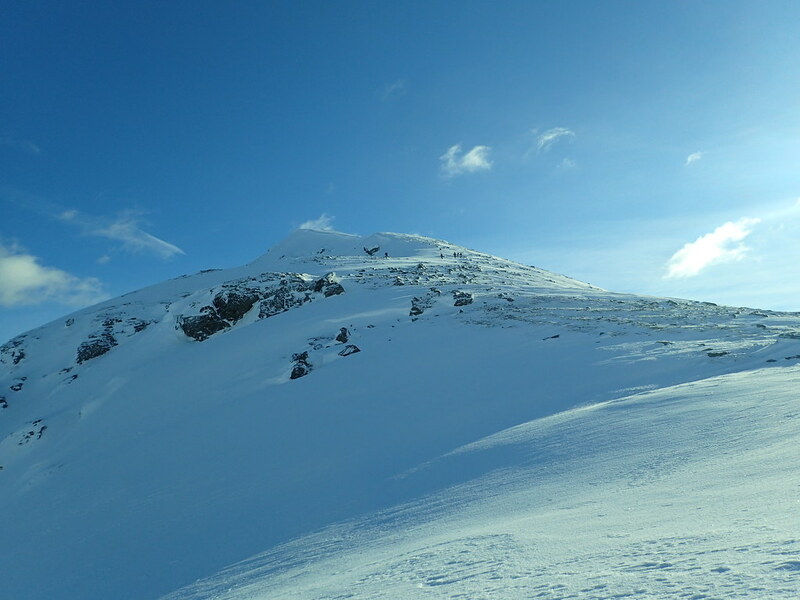 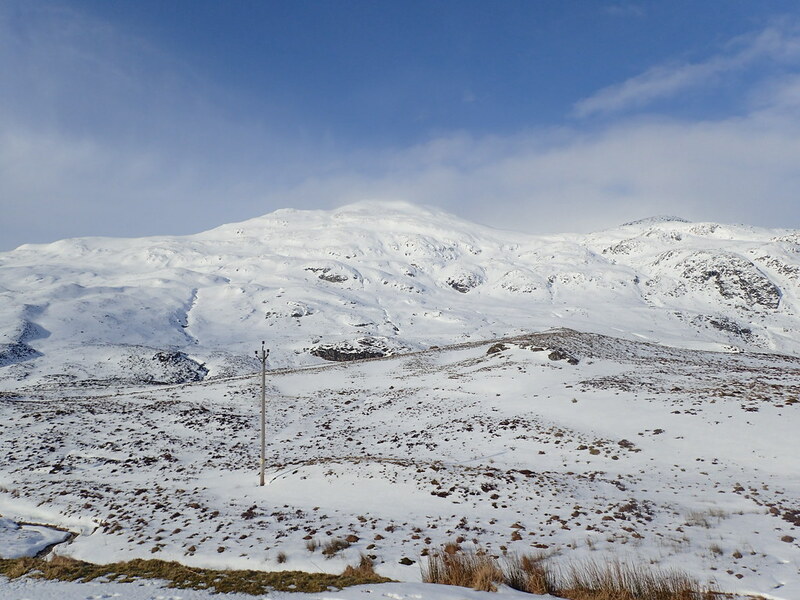 Blue skies, a ski munro, two cracking descents, and ski to/from the car on excellent snow with great company. 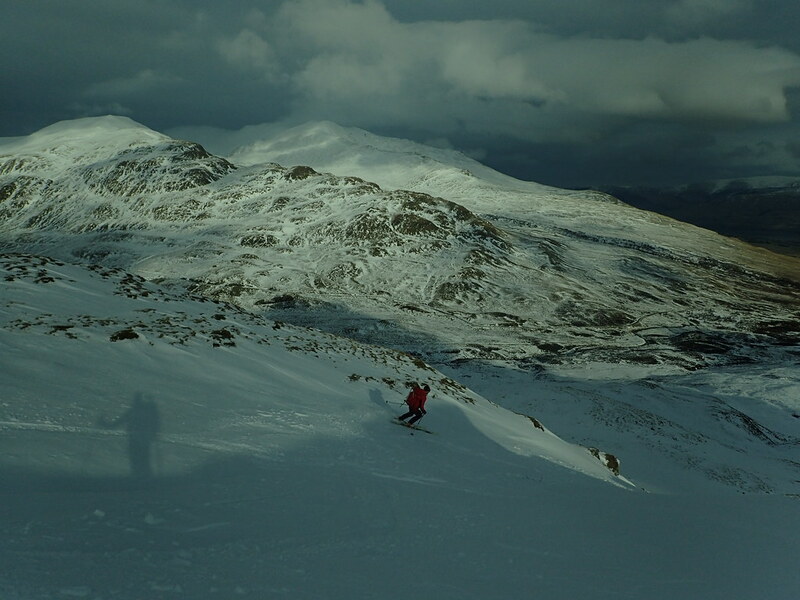 Does a day get better than this? 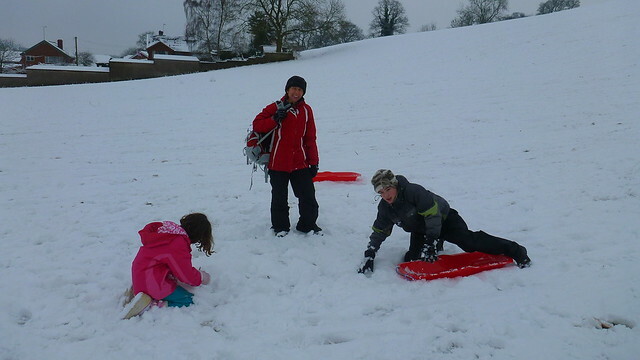 Watch this blog to find out. 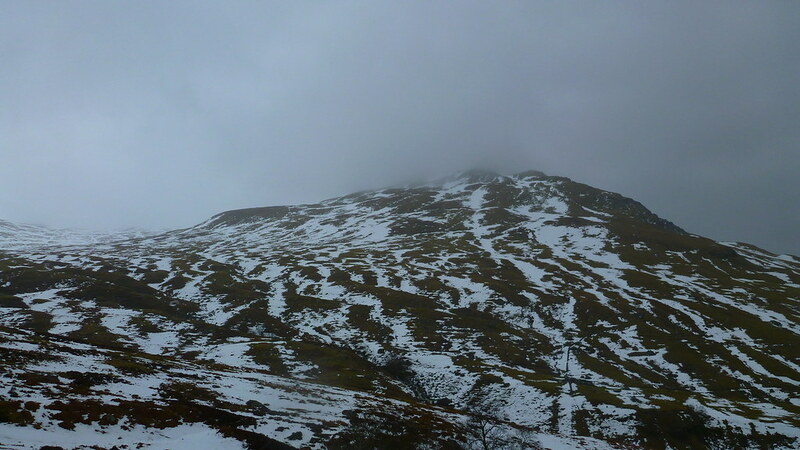 Downside is the start in Glen Lochay is low and Meall Ghaordaidh is a pretty big bugger. 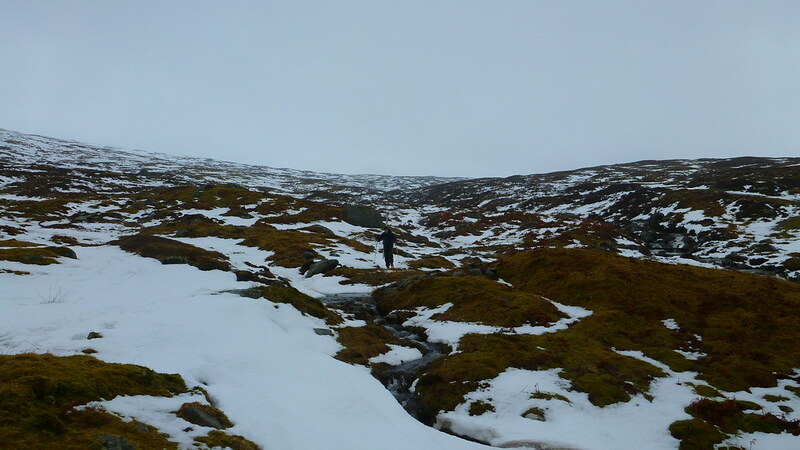 The snow wasn’t down as far as the road so some spirited walking in the damp drizzle was called for to get to the snow. 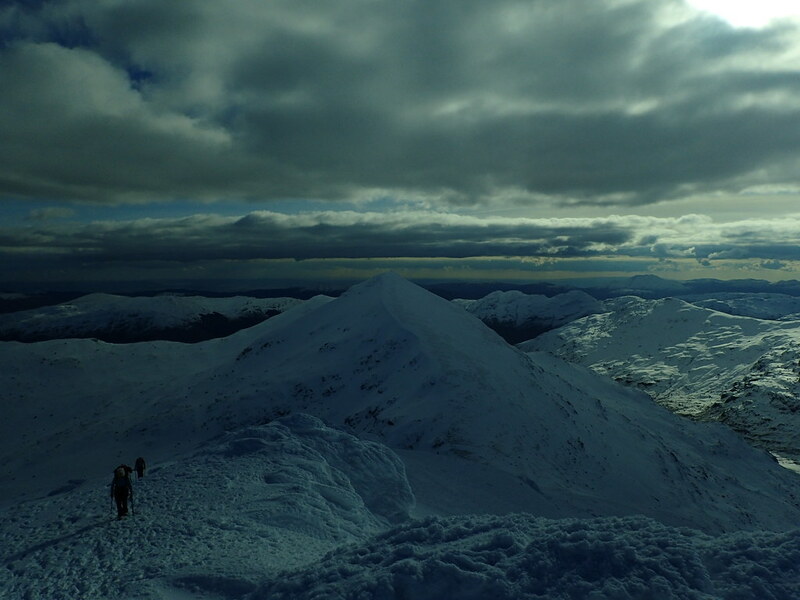 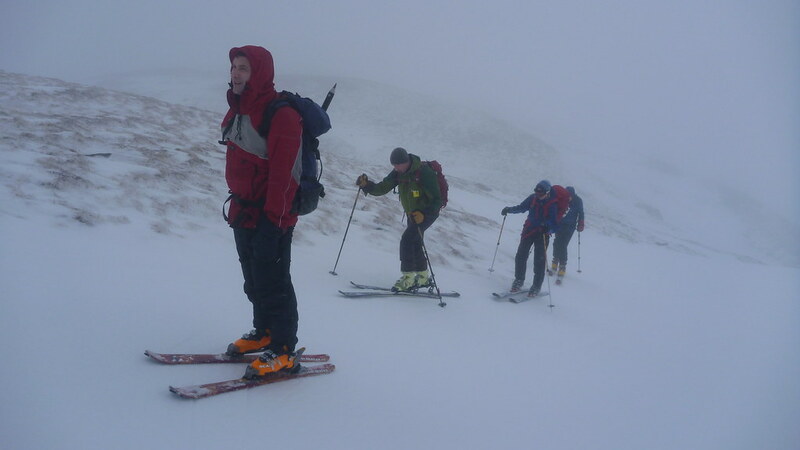 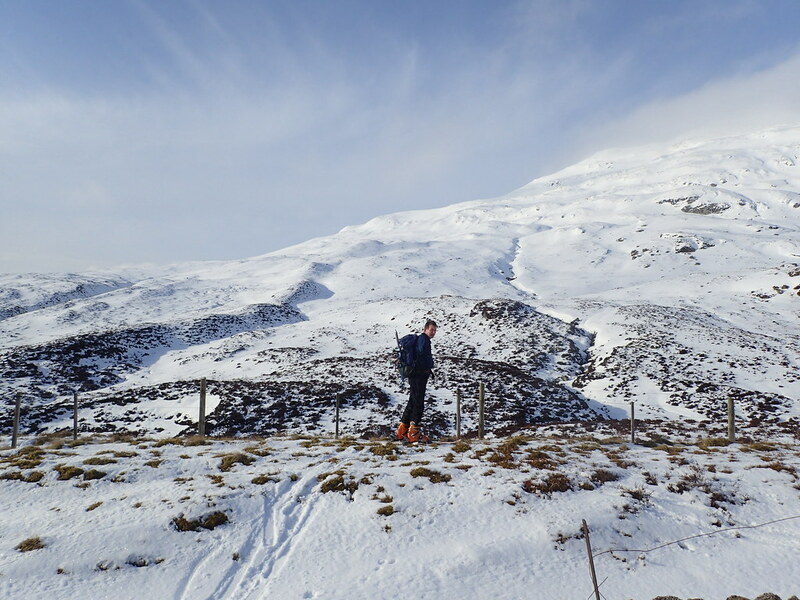 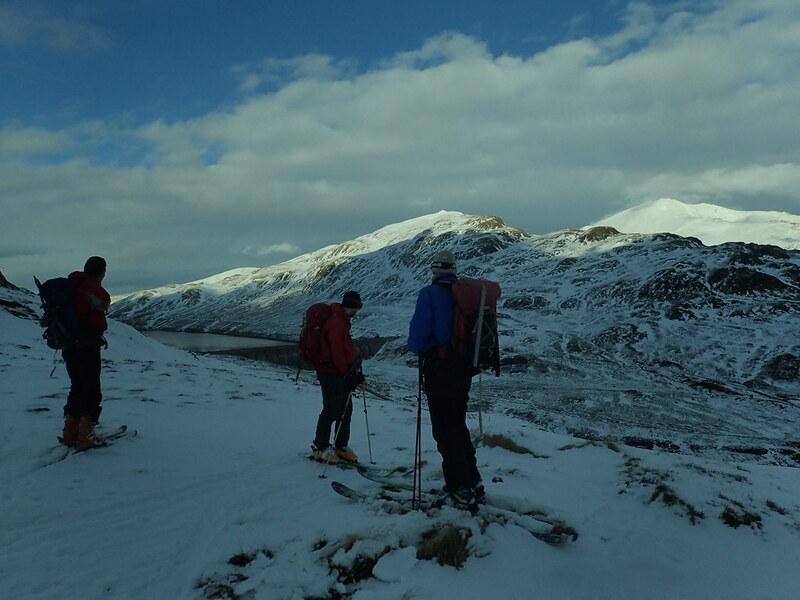 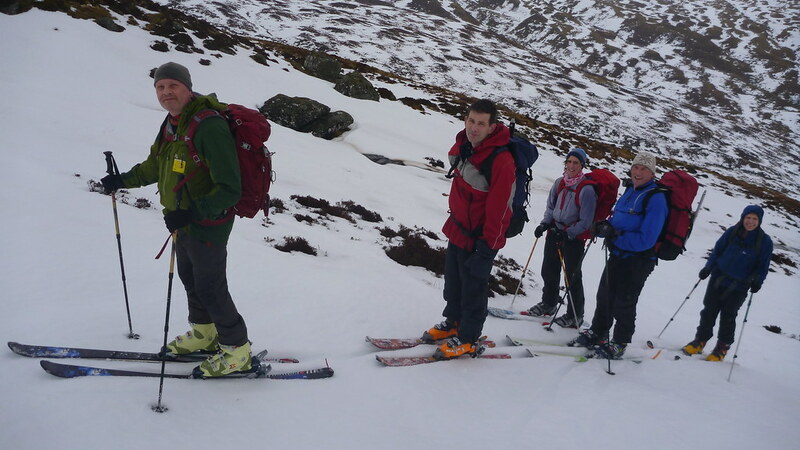 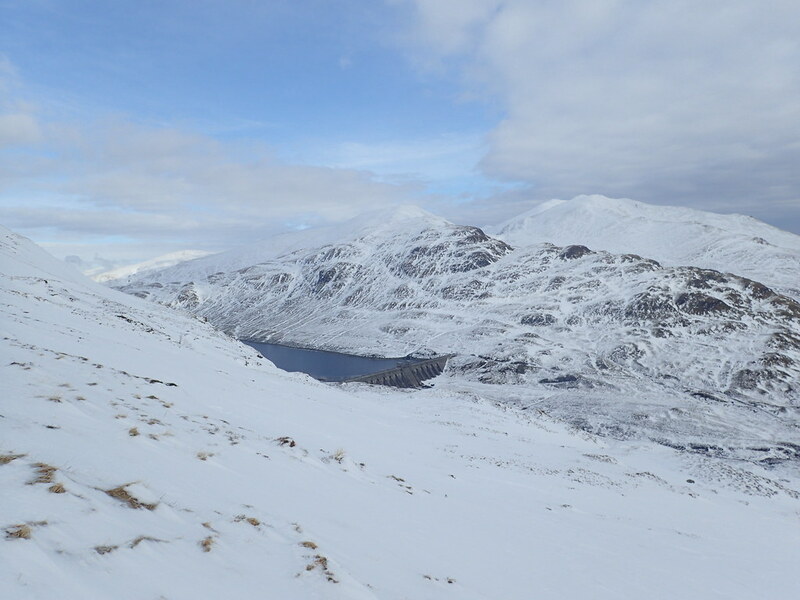 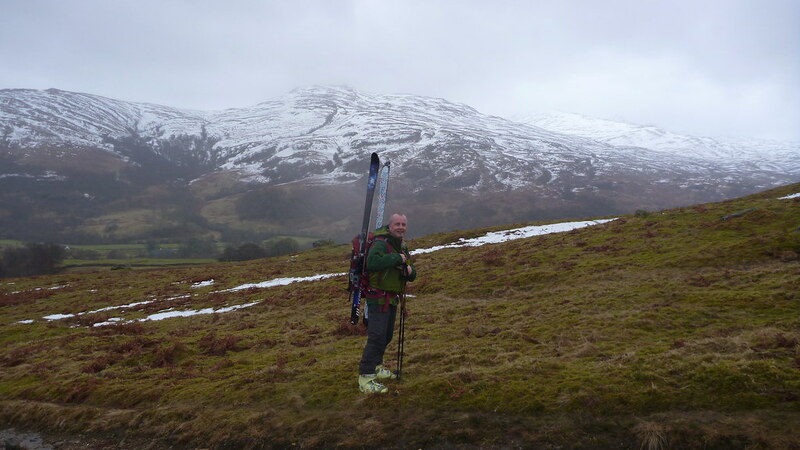 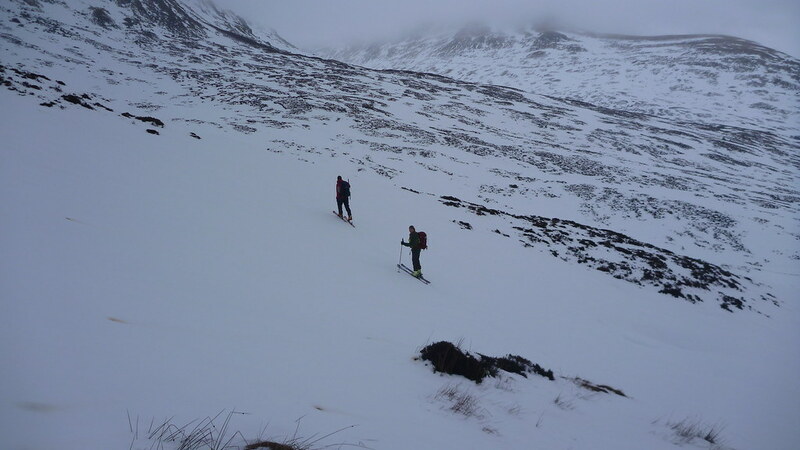 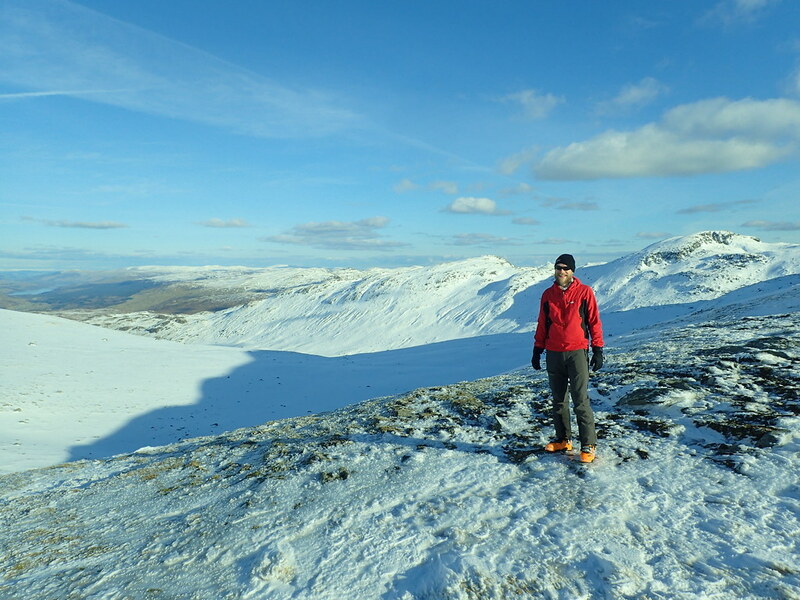 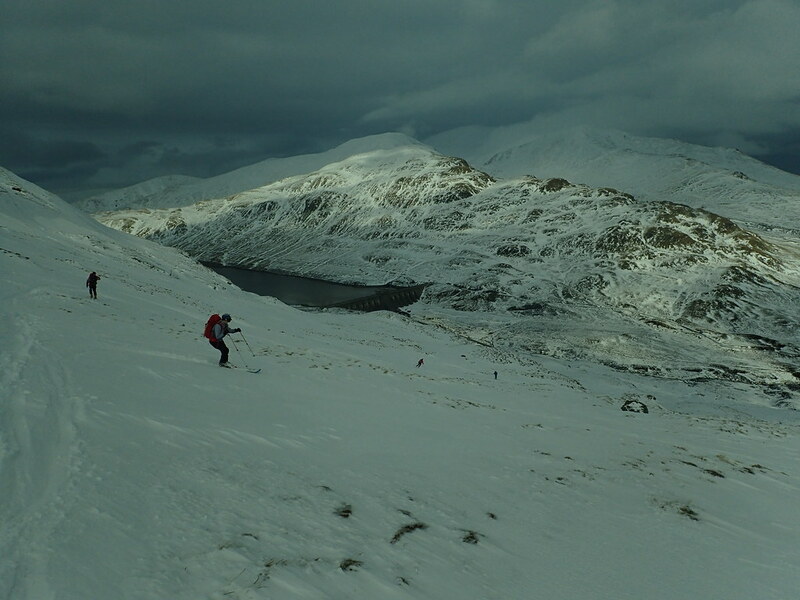 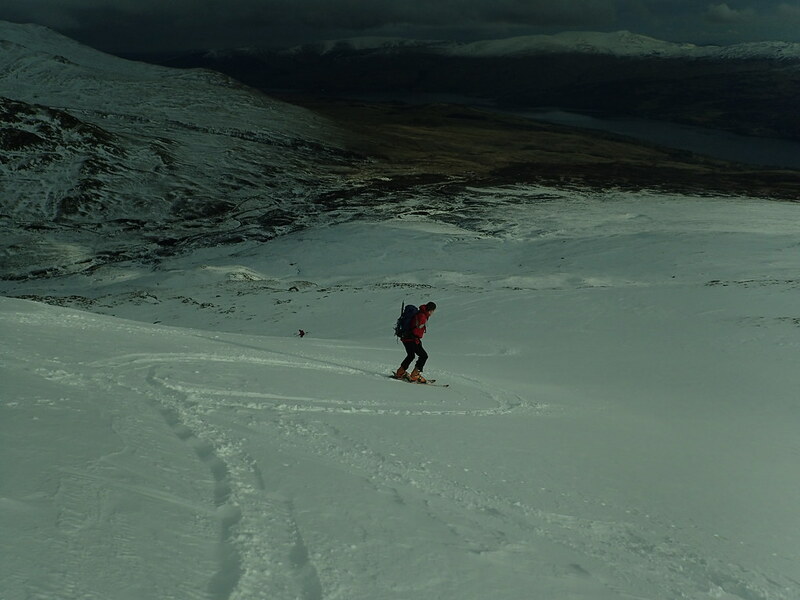 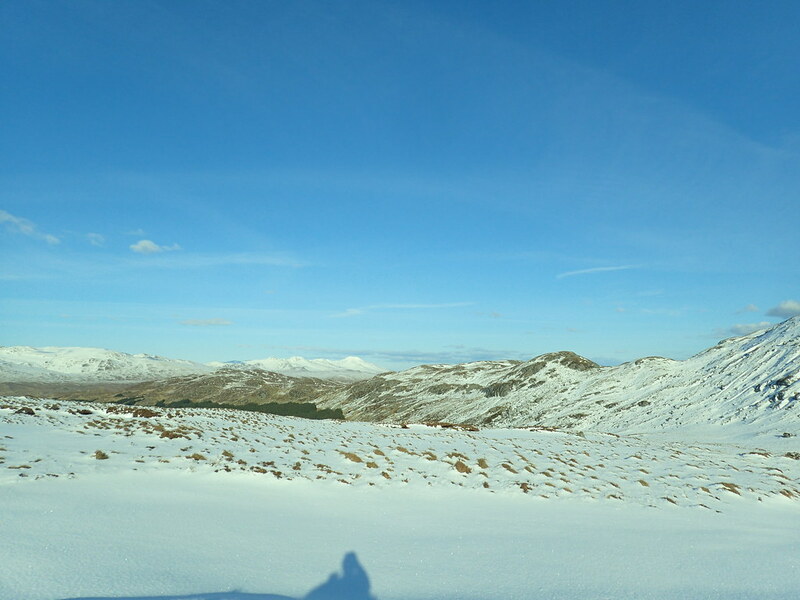 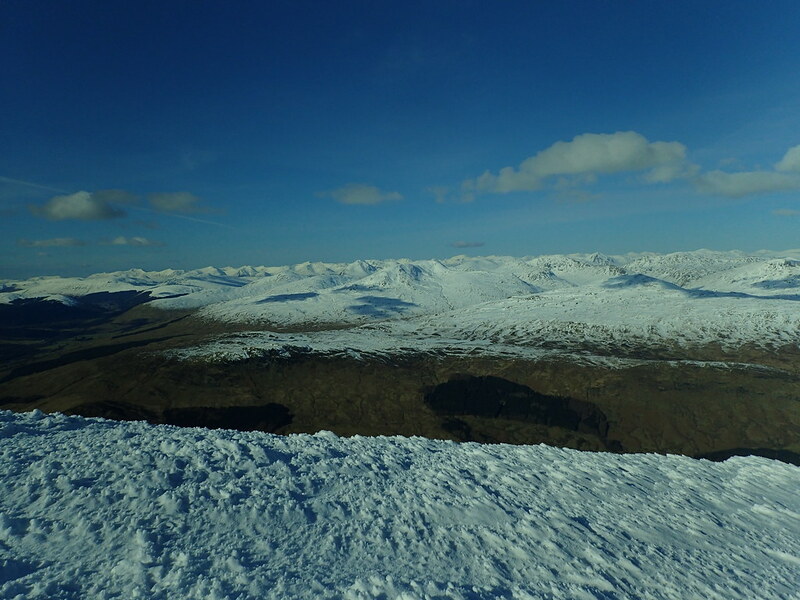 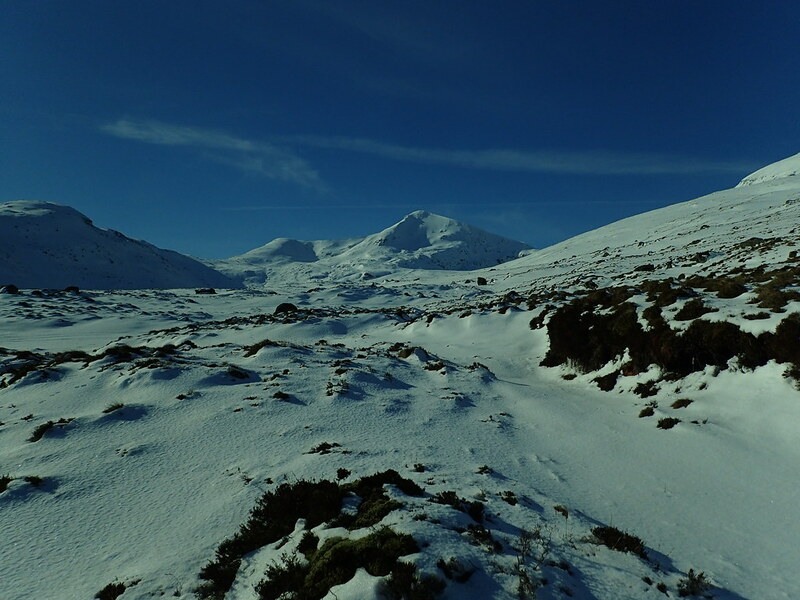 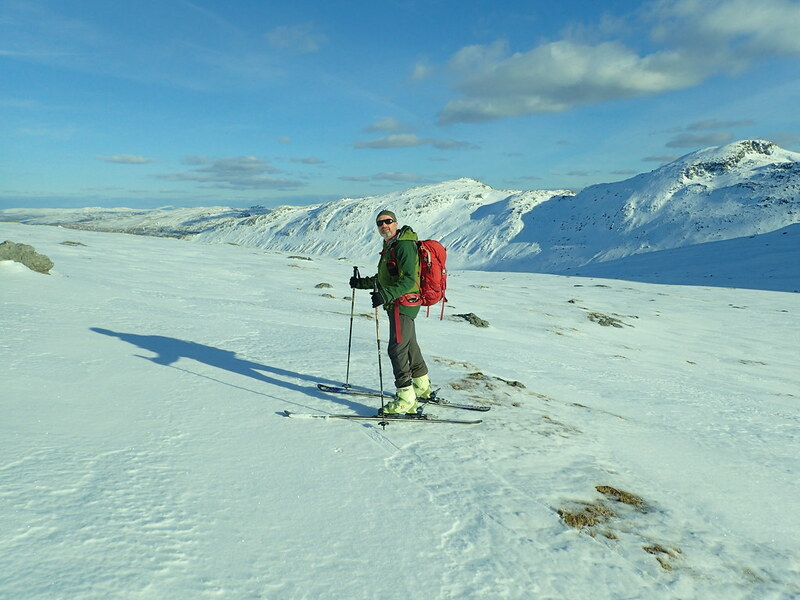 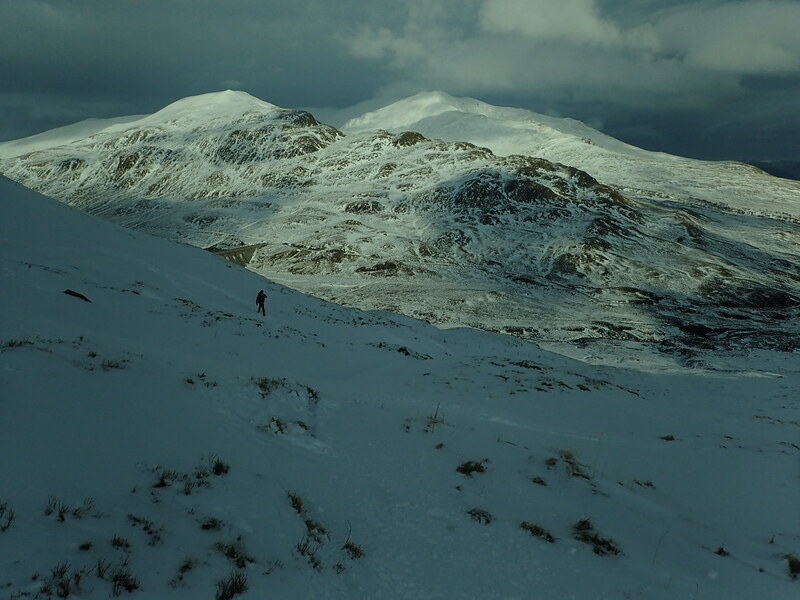 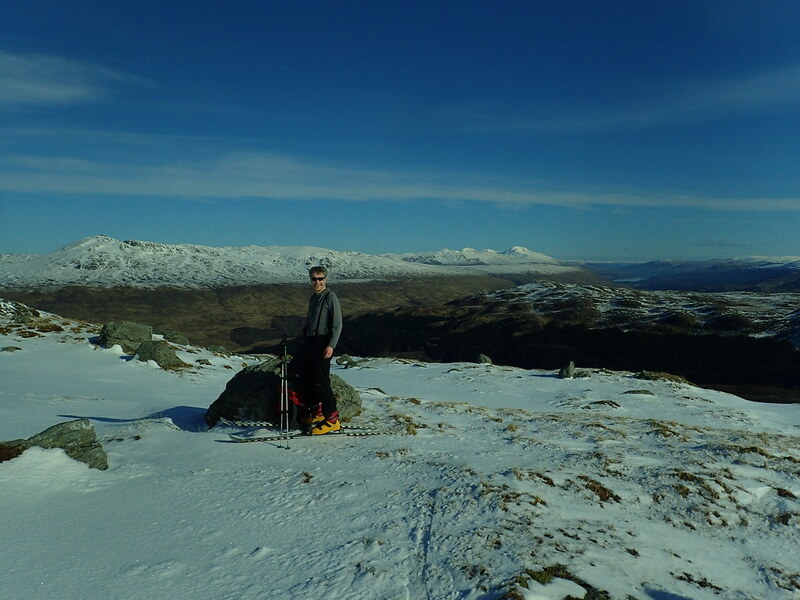 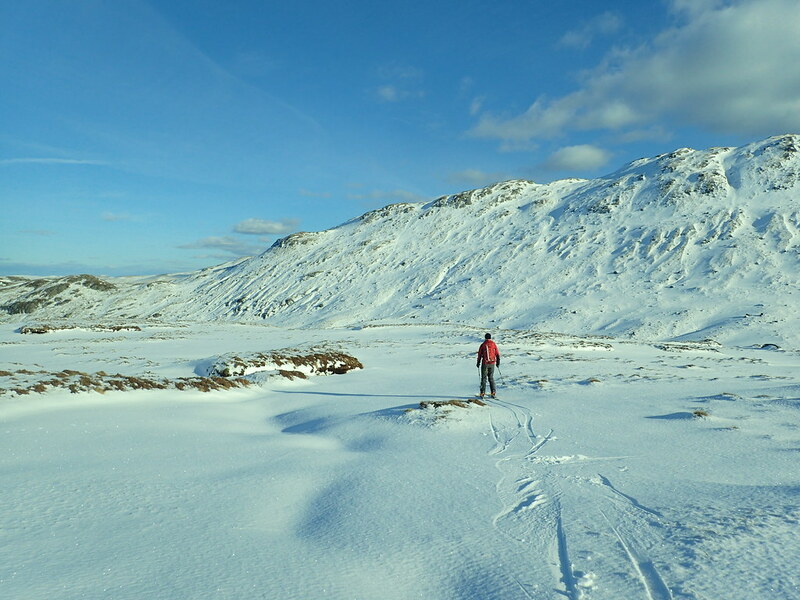 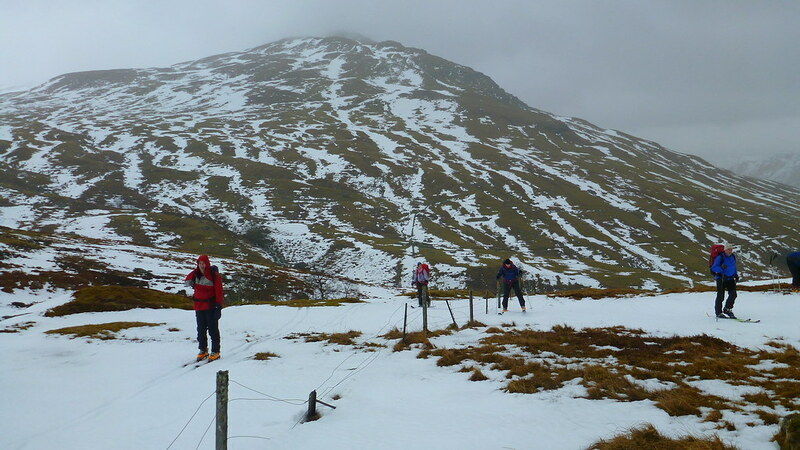 Problem with ski touring in Scotland is you often have to walk up hill to get to the snow. 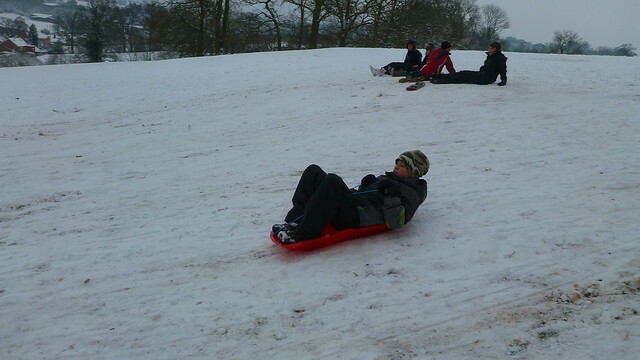 This has two main disadvantages. 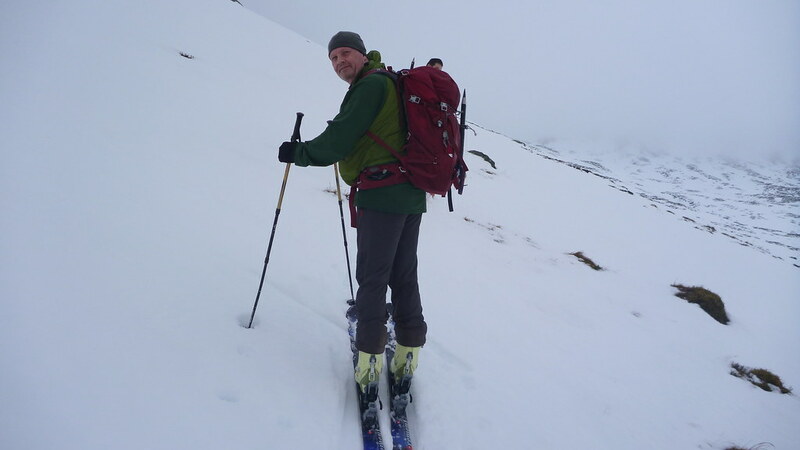 Firstly you have to wear ski touring boots, a combination of downhill boots and plastic mountaineering boots, which despite the marketing blurb are deeply uncomfortable to walk in. 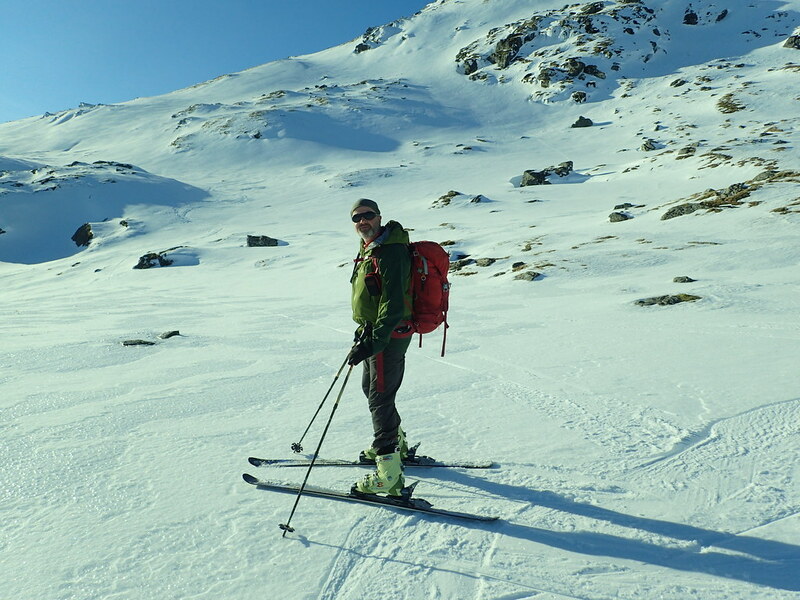 Secondly as is obvious from the photos and any degree of thought, skis are cumbersome and heavy, making for a heavy pack when combined with winter gear. 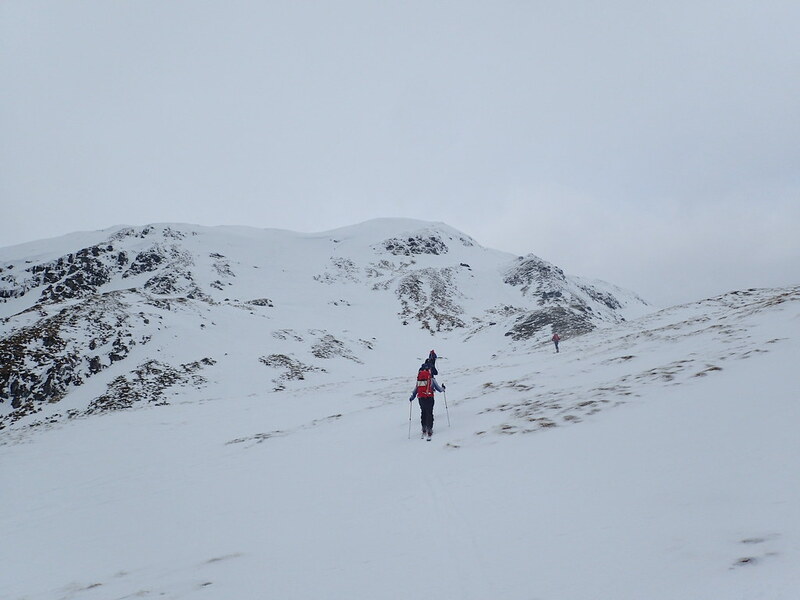 We stopped to slap on skis after 45 mins slogging up from Drumcroisk but from there progress is so much easier and swifter. 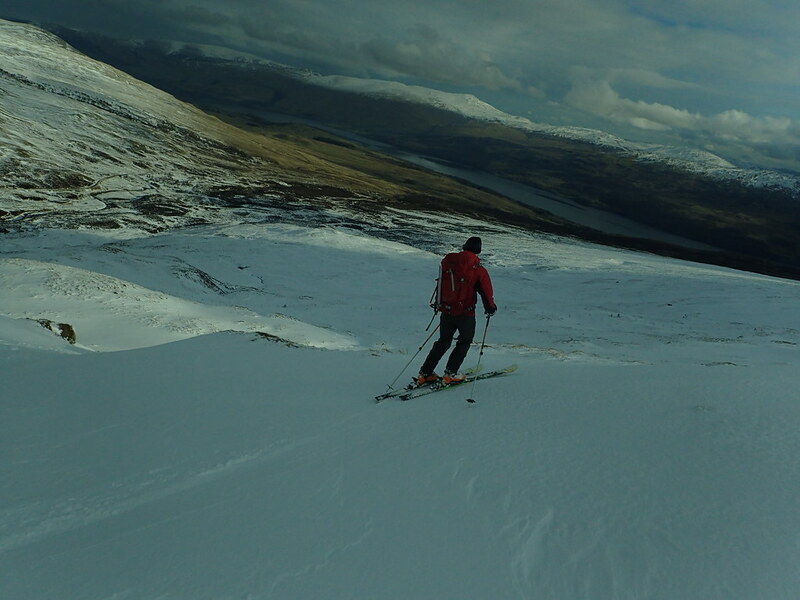 Skis take the uncertainty out of the terrain and you can set into a smooth climbing rhythm. 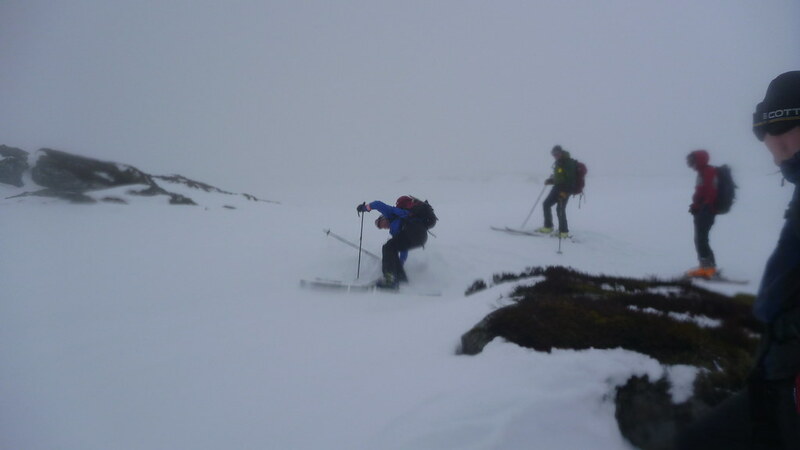 Those heavy skis and uncomfortable boots are suddenly a bonus. 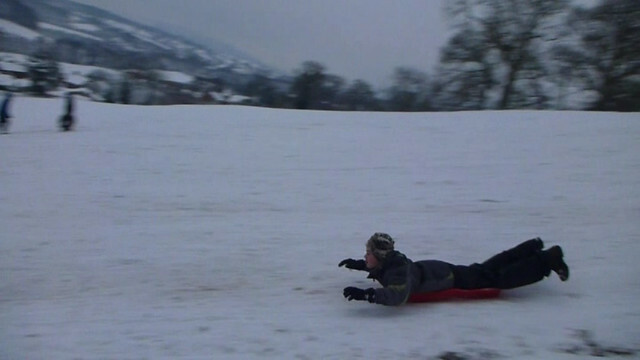 It’s still bloody hard work, don’t get me wrong but you get a much better return for your efforts. 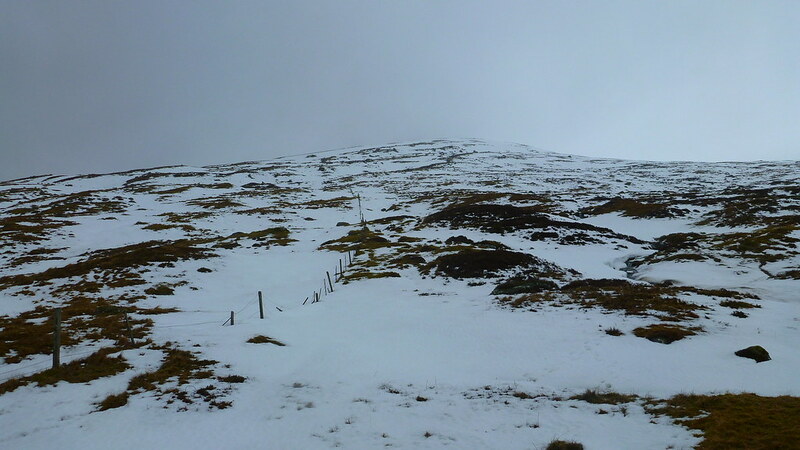 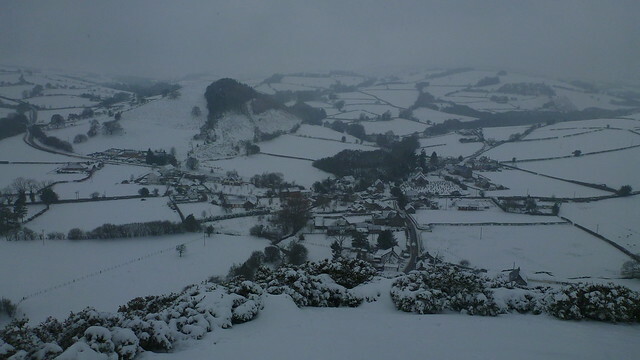 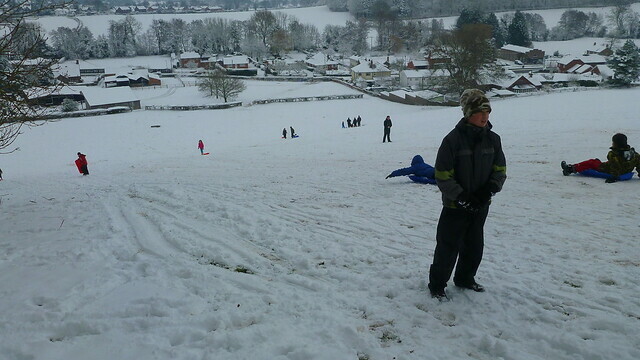 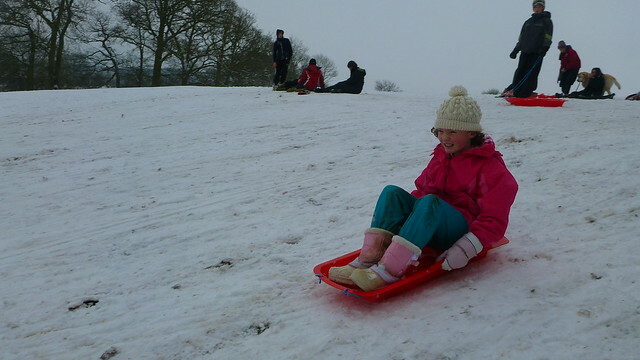 I’m pretty sure in heavy wet snow there is no way we’d have got to the top. 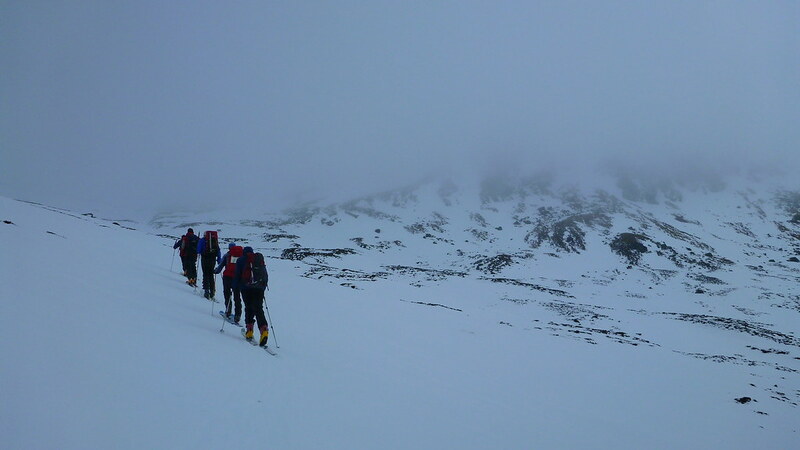 In fact we were up and down in around 5 hours. 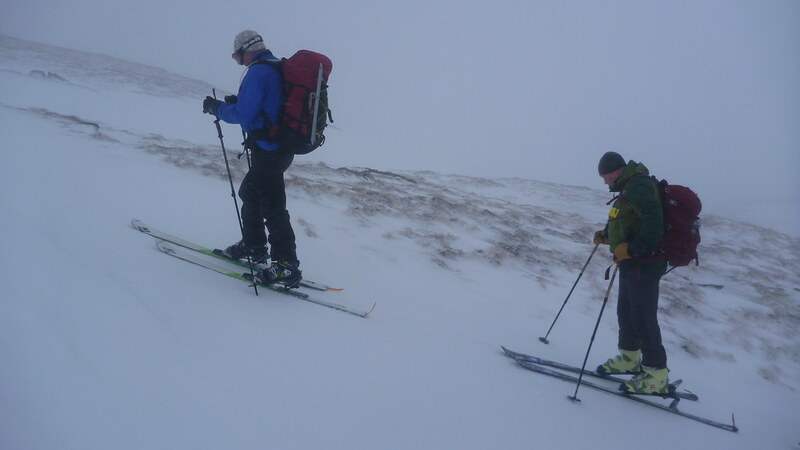 There is a certain pleasure even on a miserable day like this in the steady progression skis give you. 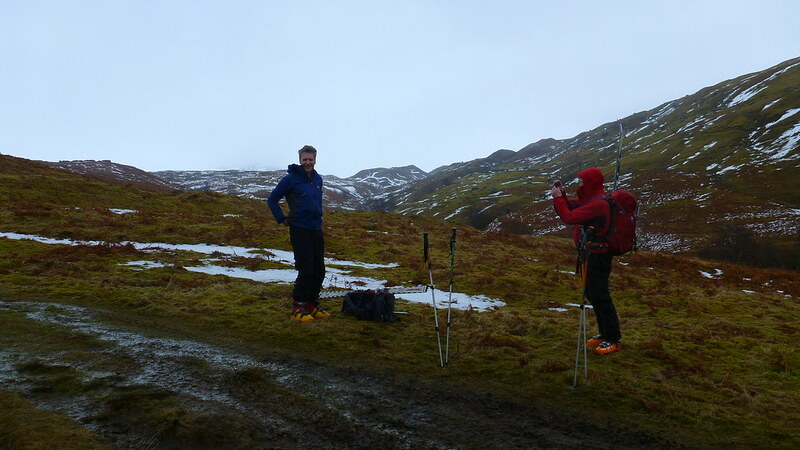 On foot this would have been a real grind, a grim relentless rigour of exhaustion and wet feet. 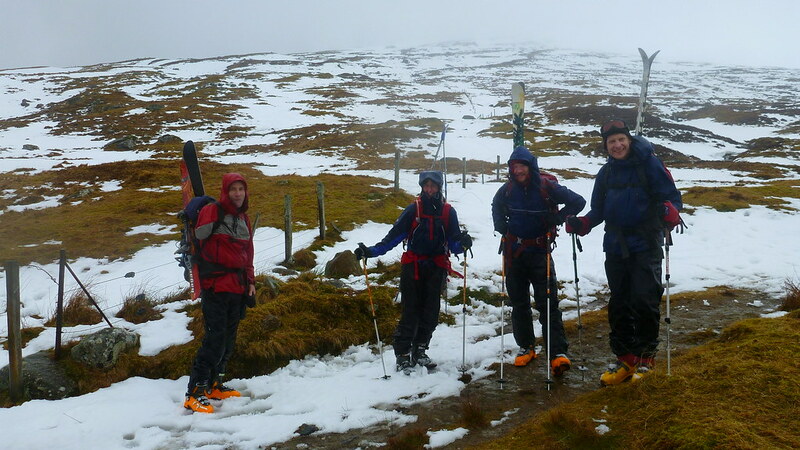 My recollection of the climb was of hard work laced with good humour and enjoyment. 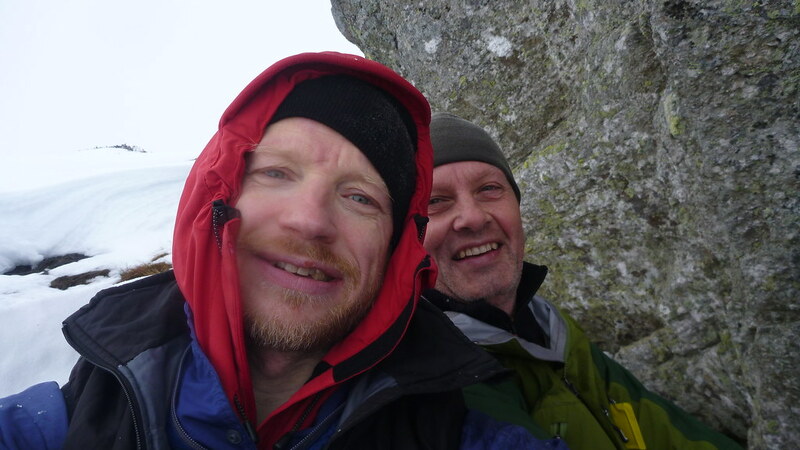 We had a swift lunch under a boulder, surmising quite correctly that the summit would be unpleasant. 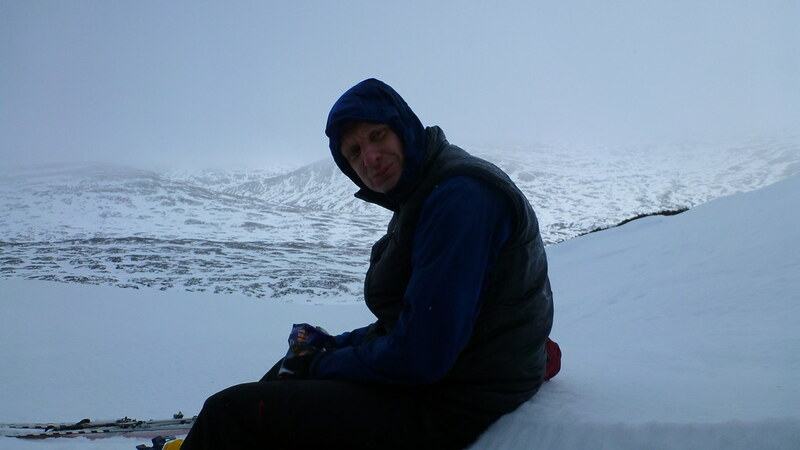 A chance to capture the grim cheerfulness and take some very suspicious selfies. 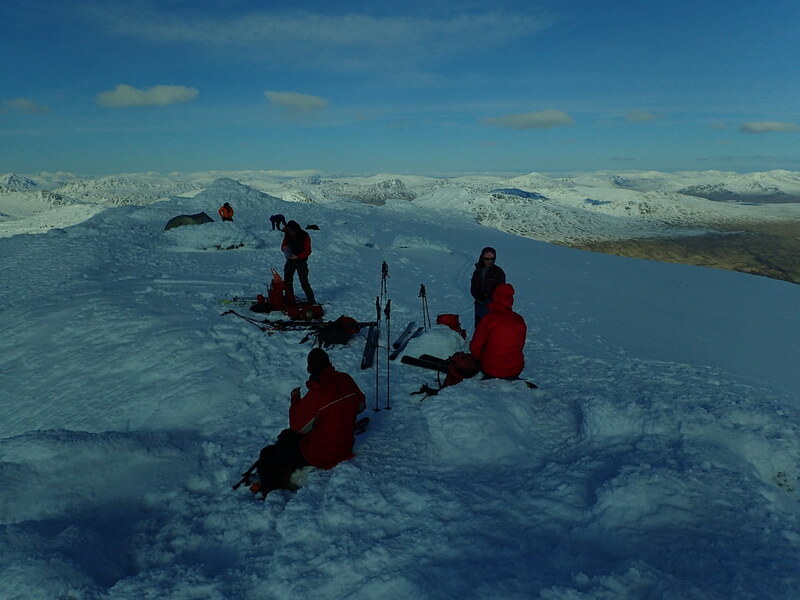 The summit was blasted by icy winds and spindrift, barely time to pat the cairn, recognise the tick before changing to downhill mode. 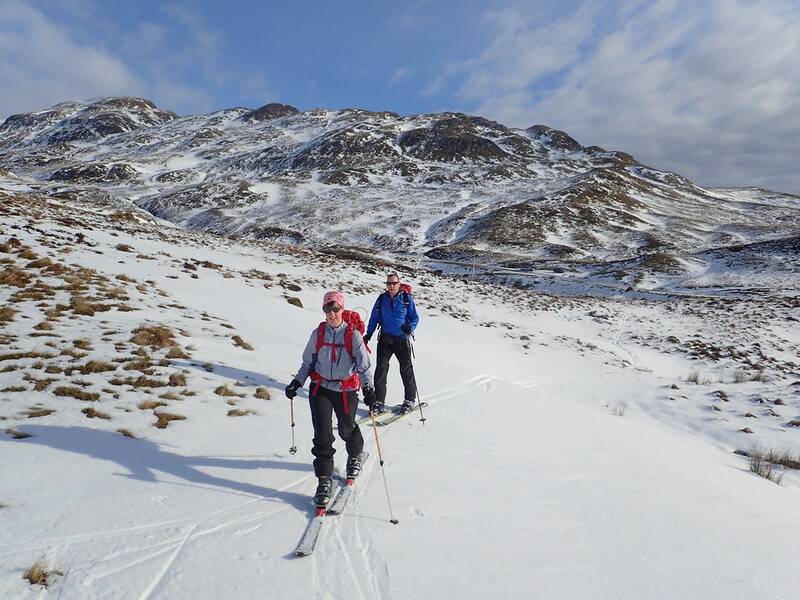 And here’s the other very obvious good reason for ski touring. 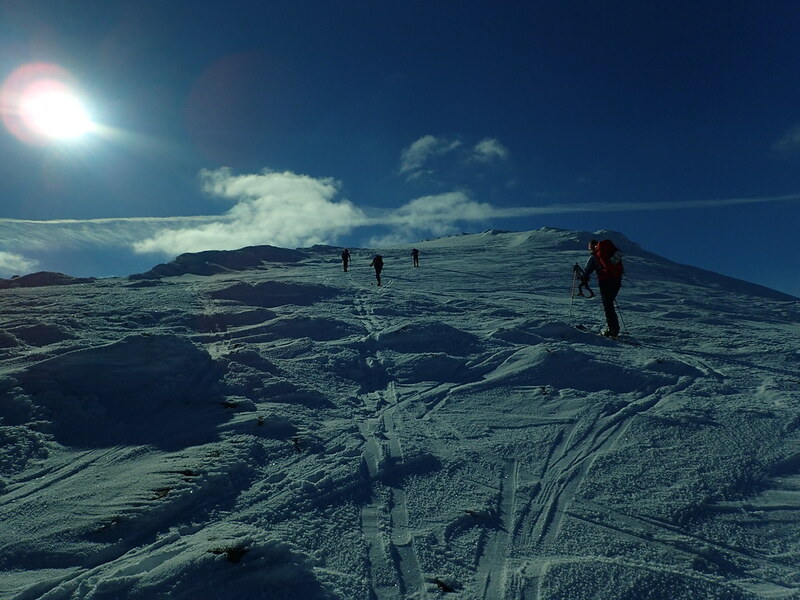 Coming back down is swift and FUN! 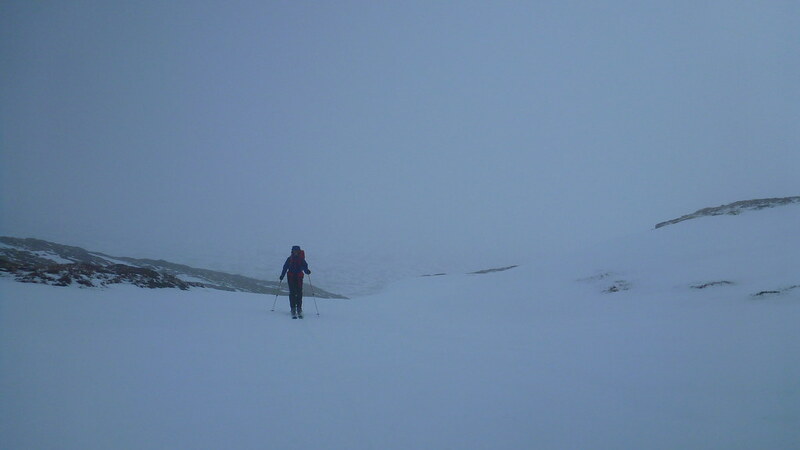 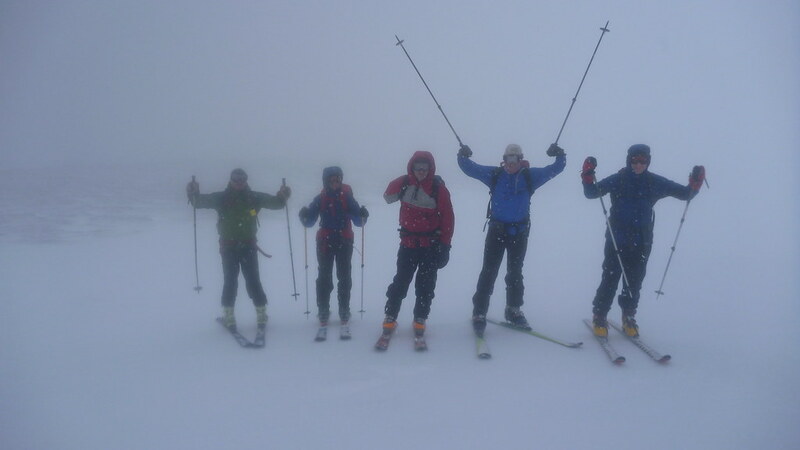 The icy summit slopes in a white-out proved interesting as did trying to ski in the snow equivalent of porridge. 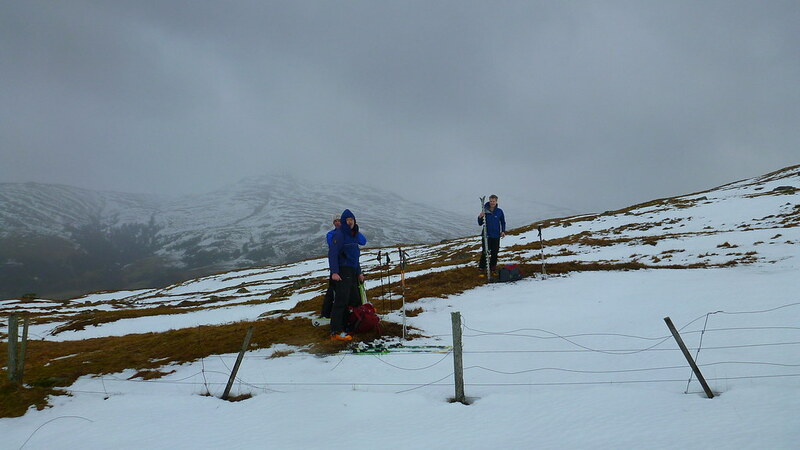 By now the snow of high up had turned to rain and as we de-skiied it rained with a real vengeance. 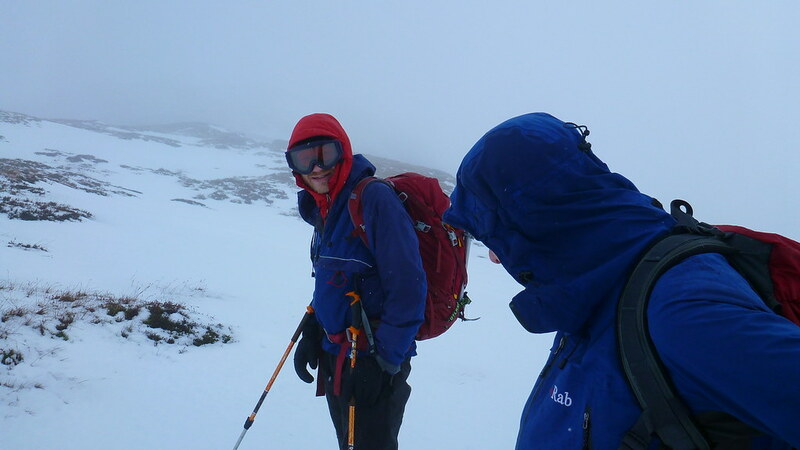 I haven’t been that wet returning from a day in the mountains in some years. 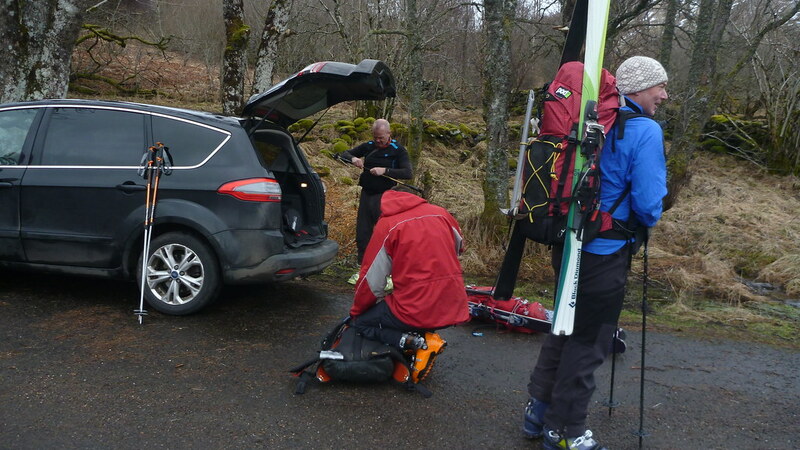 Actually I tell a lie, I was this wet after last years walk up Ben Venue but you get my drift.